I'm not sure what I was thinking when I booked my flight to Sydney at 7:00 am on Sunday morning. 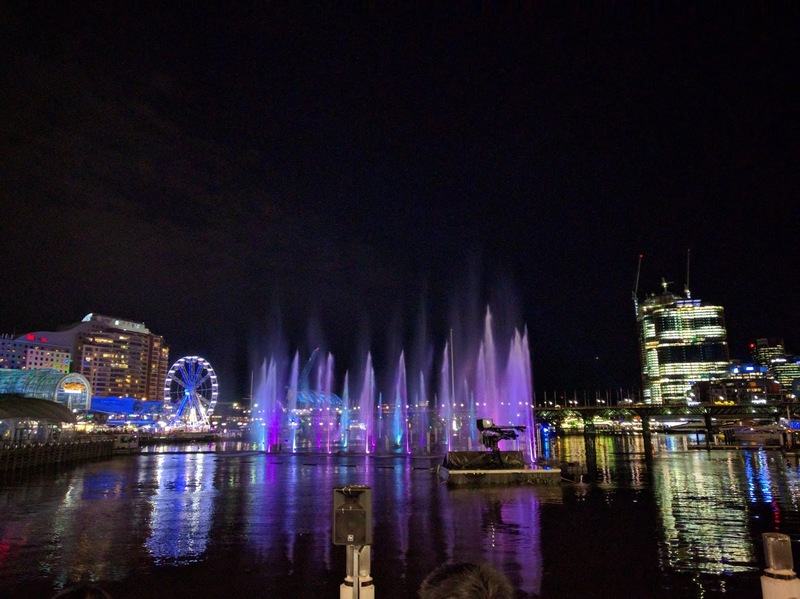 This meant I ended up having to wake up at 3am to take the SkyBus (City to Airport Bus) to the airport. 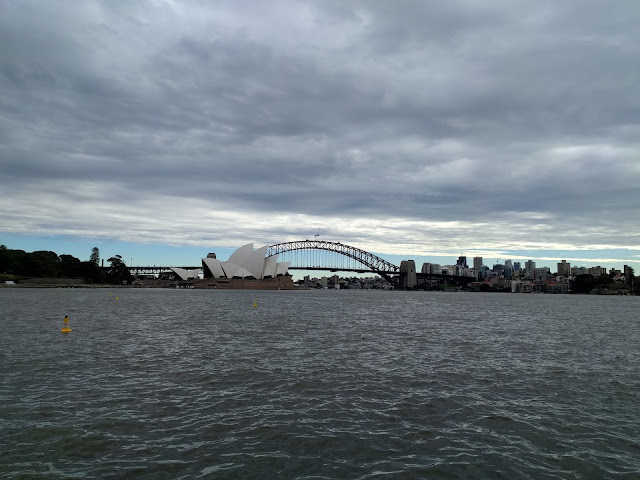 The flight itself was delayed as we had to circle the airport as there was a big queue of planes waiting to land due to the storm that was pounding Sydney. 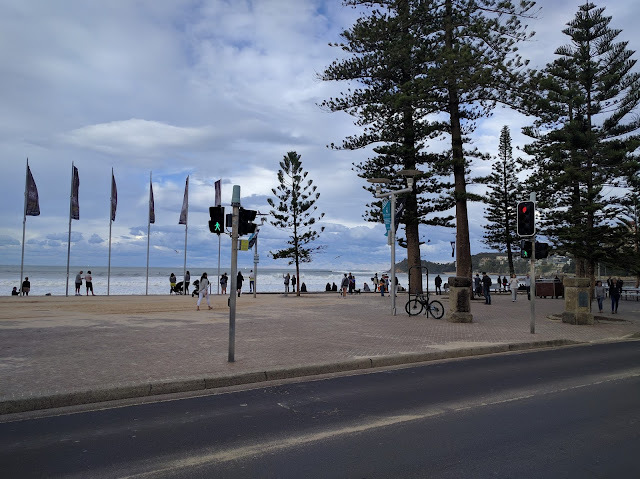 My plane was minutes away from having to divert to the Gold Coast as we didn't have enough fuel to keep waiting, but luckily we squeaked in as other planes ahead of us in the queue decided to divert. 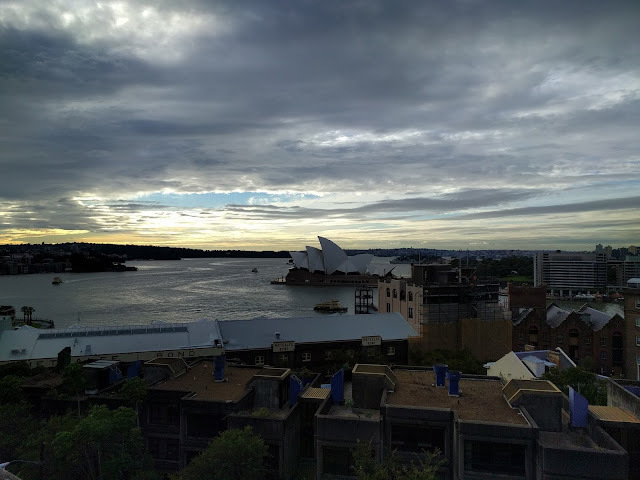 Due to the storm, I spent the Sunday relaxing in my hostel at Sydney Harbour YHA - The Rocks (Affiliate Link) and tried to do some planning for my week in Sydney. 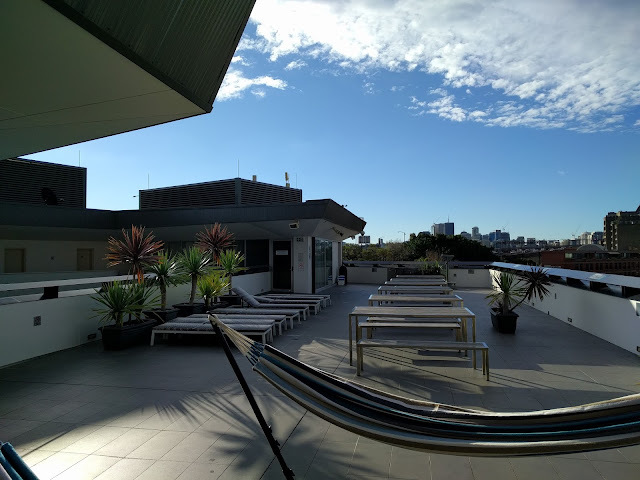 The hostel itself is one of the best hostels I've stayed at in terms of it's location at the Rocks (awesome views of the Sydney Harbor) and is certainly highly recommended when visiting Sydney. By Monday the storm was dying down and I was finally able to get out and experience Sydney. The first thing on my agenda was to take a look at the Sydney Harbor Bridge. 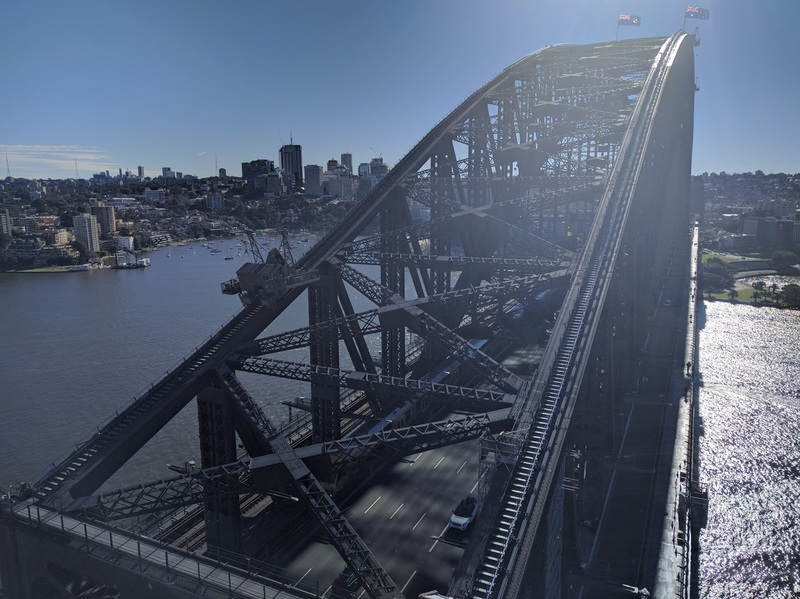 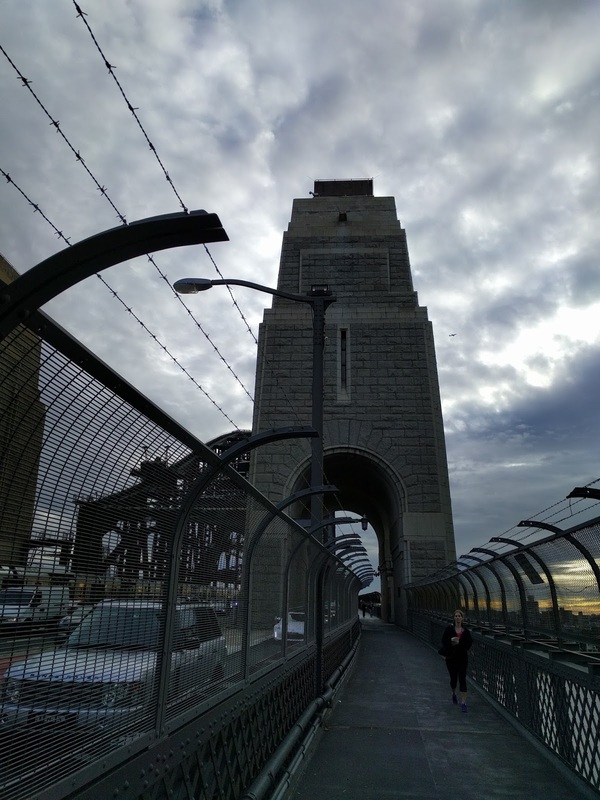 I decided to save some money and walk the Sydney Harbor Bridge from the Rocks to Milsons Point instead of going on the Bridge Climb for a few hundred dollars. 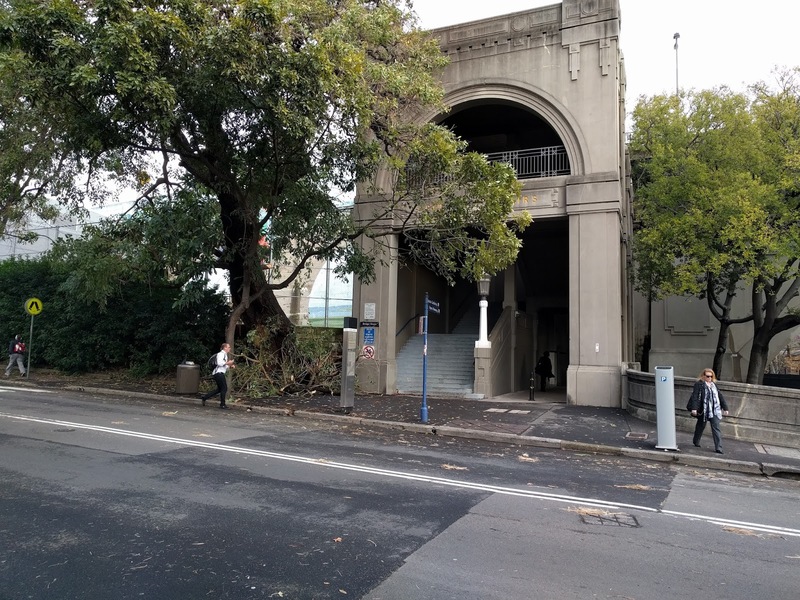 The entrance to walk the Sydney Harbor Bridge is on Cumberland Street close to the Sydney Harbor YHA. 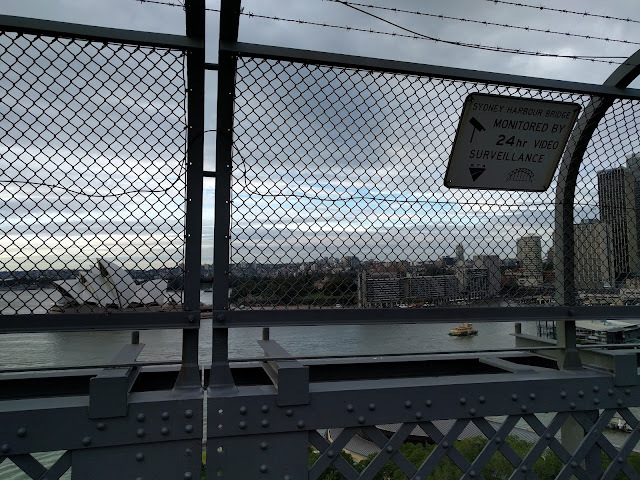 The walk was itself was a good way to get a view of the Sydney Harbour, and whilst I walked all the way across to Milsons Point, if you are short in time walking halfway across the bridge and back should be more than sufficient as there wasn't really much to see at Milsons Point. It's also worth noting that the entrance to the Python Lookout is roughly halfway across the bridge and at 13 AUD is is a relatively inexpensive way to get panoramic views. As I was there before it's opening time of 10:00 am, I decided to come back another day. After spending some time wandering around Milsons Point, I walked back across the Harbour Bridge and headed towards the Sydney Opera House via the pedestrian walkway on Cahill Expressway. 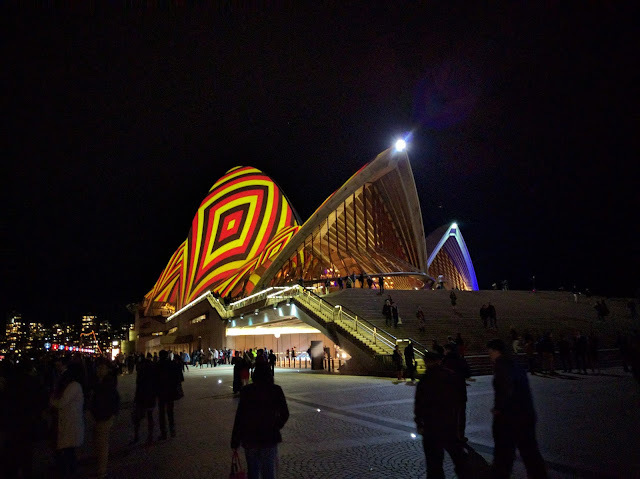 The opera house viewed outside is an engineering marvel, and for me having a look outside was enough as I wasn't really motivated to pay lots of money for the shows or tours that would allow me to have a look inside the building. 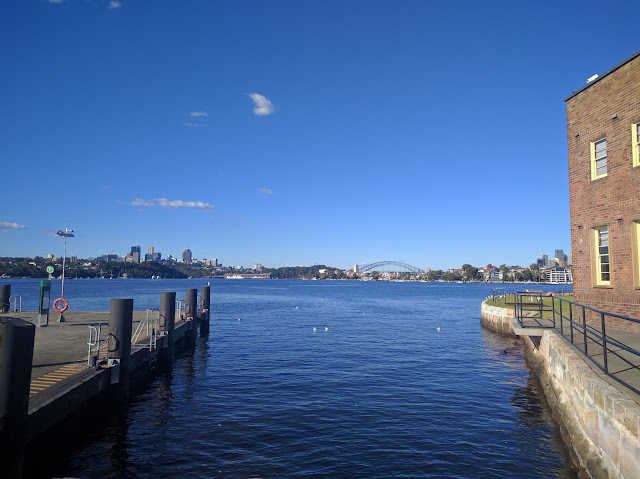 Next up I took the chance to walk around the Botanical Gardens and whilst there took the opportunity to check out Mr's Macquarie's Chair, and though the chair itself wasn't very interesting to me, the views from there overlooking the Sydney Harbour was nice and well worth checking out when in the area. 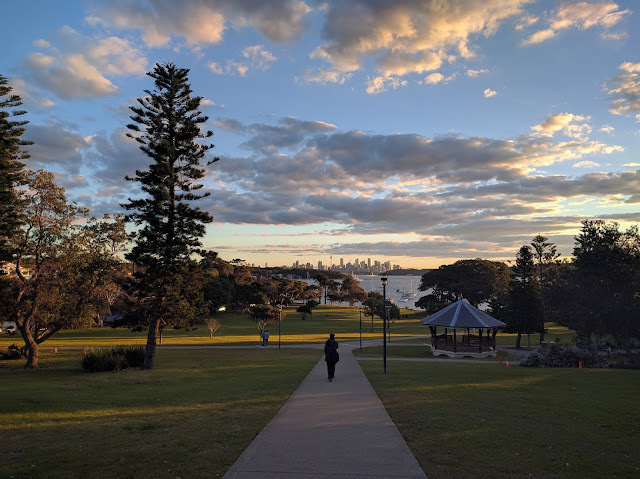 Walking around the botanic gardens also provides a way to get away from the city life and enjoy the peacefulness of nature. After the botanical gardens, I headed down to the Chinatown to grab a late lunch at one of the food courts, before heading back to my hostel to relax prior to visiting Vivid Sydney (a festival that occurs once every year) in the evening. 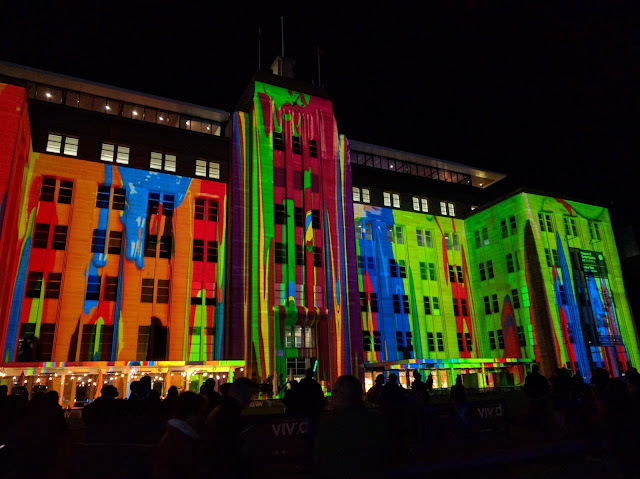 After dinner, I headed over to circular quay to see Vivid Sydney. The lights start glowing at 8:00 pm and I was able to witness the get a great panoramic view of the beautiful scenery on the Cahill Expressway. 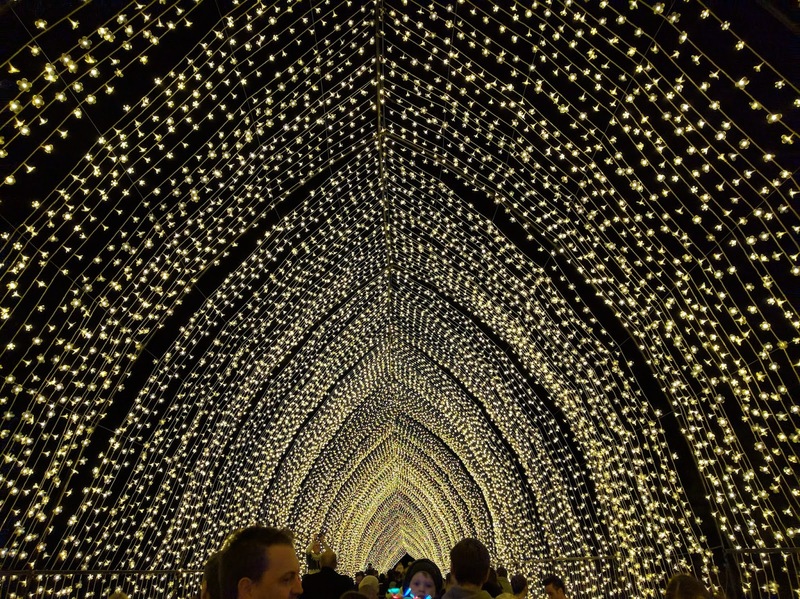 I have to say this is one of the most beautiful light scenery I have seen and is even more magical than what I saw in Paris and Rome. 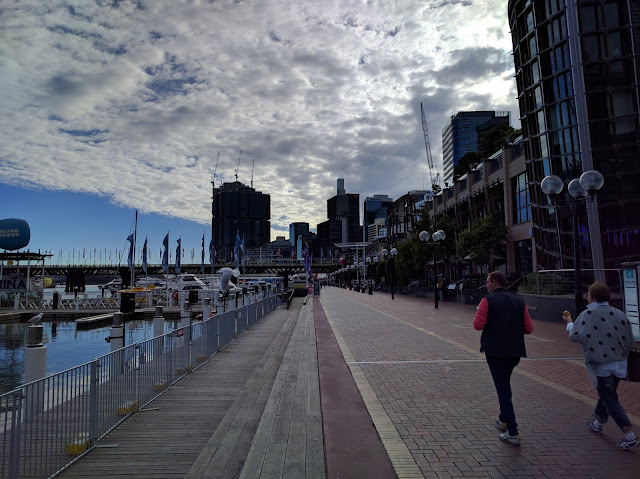 Today I decided to spend the morning having a look around Darling Harbour before having lunch at the Sydney Fish Market. 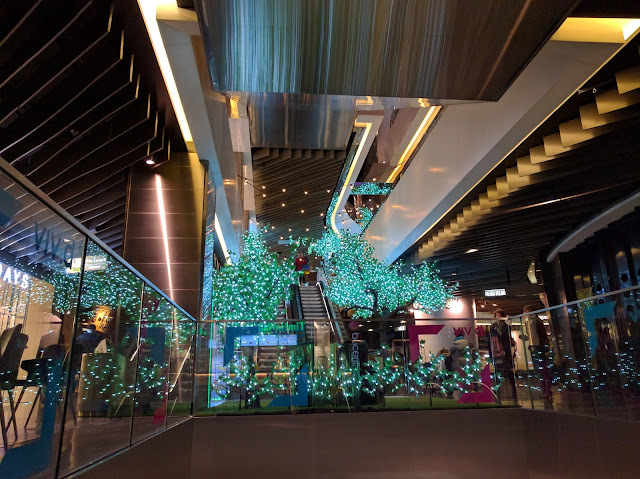 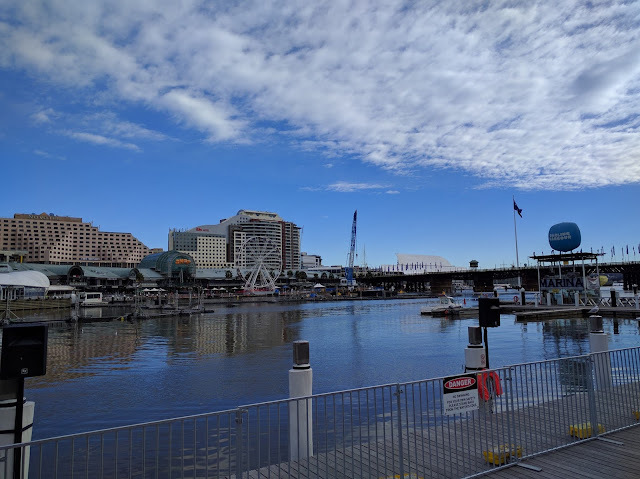 Darling harbour during the day was somewhat underwhelming, but it is the place to be if you want to go see a movie at IMAX, SEA LIFE Sydney Aquarium or Madame Tussauds Wax Museum. Next up, I walked to the Sydney Fish Markets to indulge in some seafood. This was one of the things I was looking forward to, and on arrival I bought lunch at Fish Market Cafe who provides a range of ready cooked seafood. 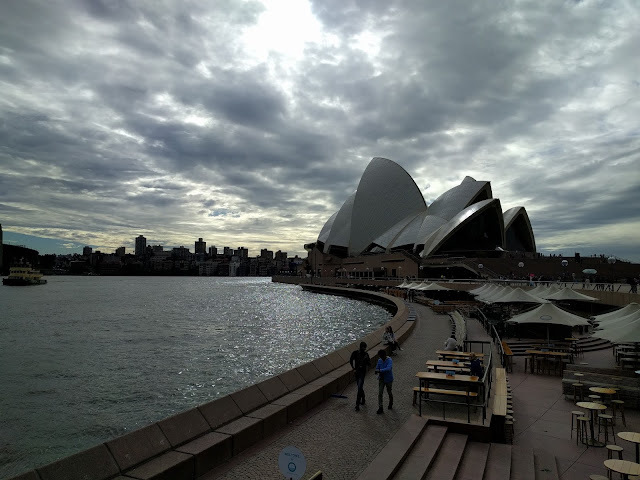 Unfortunately, the food was very disappointing and for 40 AUD the worst meal I had in my trip (especially the scallops which was not fresh). 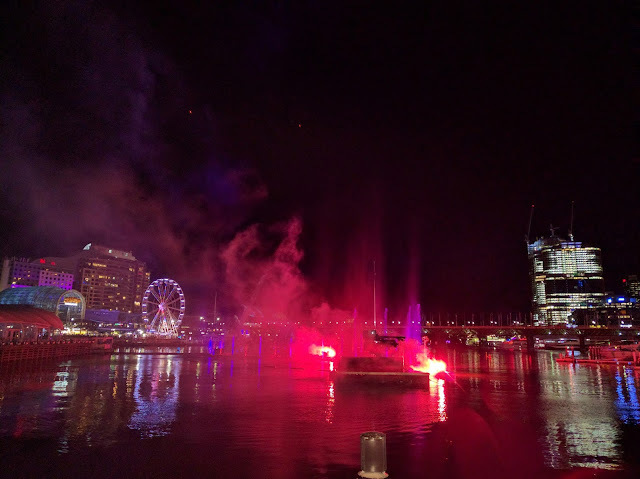 However on reflection, given that the food I purchased was pre-cooked perhaps this should not have surprised me. 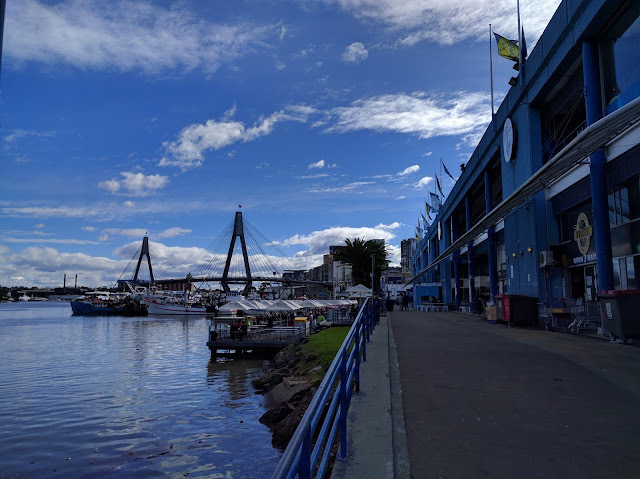 My recommendations for anyone going to the fish market is to buy your seafood fresh and ask one of the stores to cook it for you. 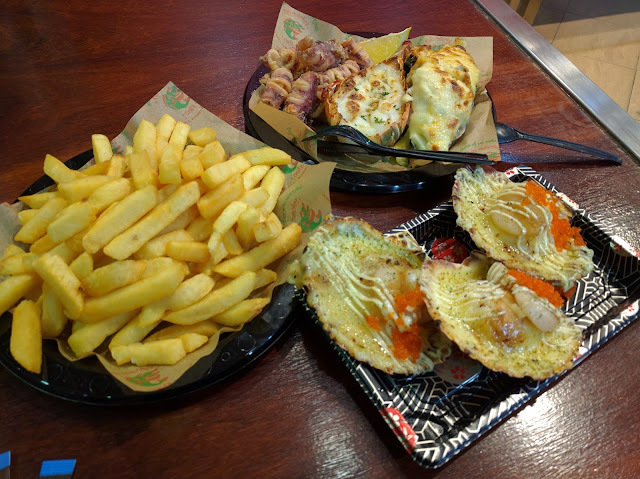 I would encourage you to buy meals from the other stores, but if you still want to buy your meal from the Fish Market Cafe, it would be worth buying from the menu (instead of the ready cooked displayed) and get them to cook something to order. 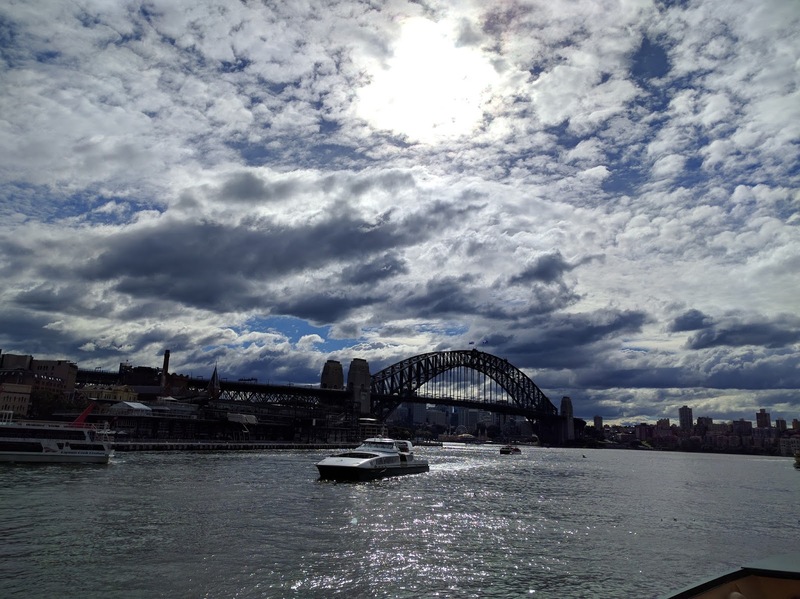 After lunch I took the bus back to circular quay to take the ferry to Manly. 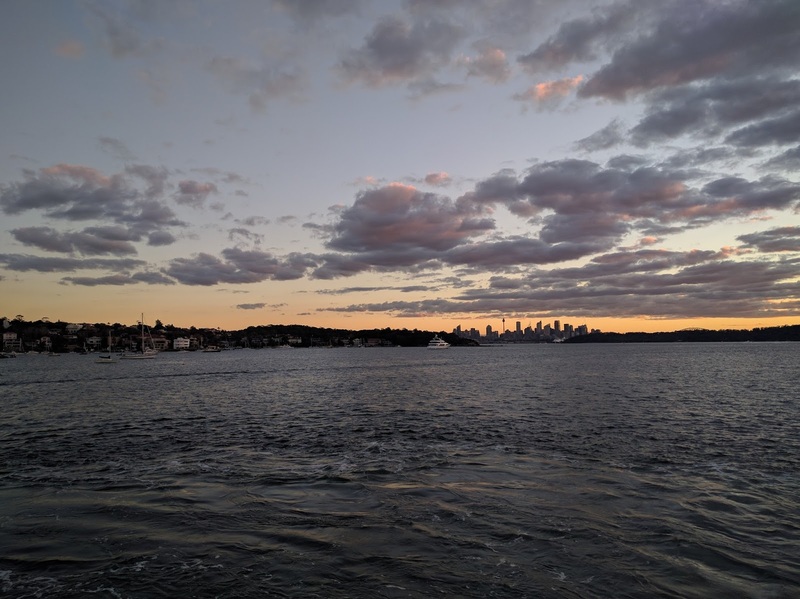 The 30 minute ferry ride to Manly was nice and featured great views of the Sydney Harbour and another highly recommended activity when in Sydney. On arrival at the Manly ferry wharf, I took the short walk to the Manly beach. 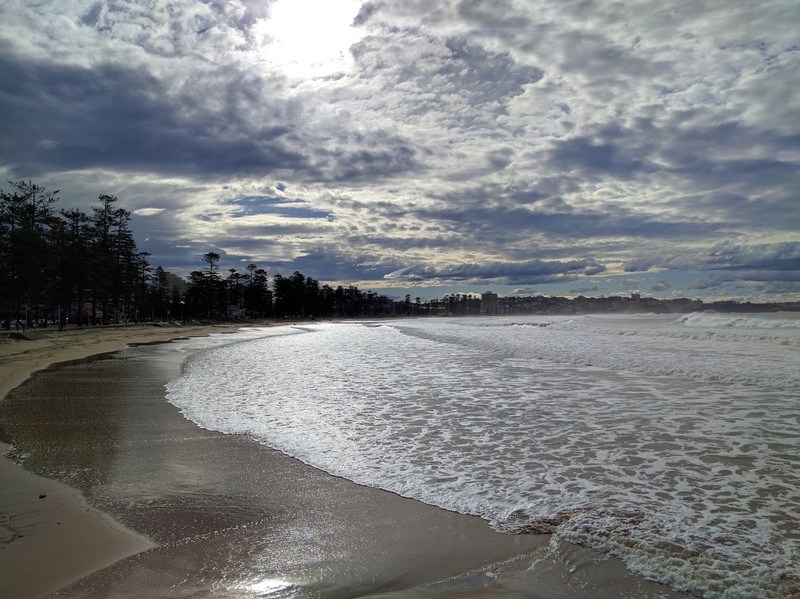 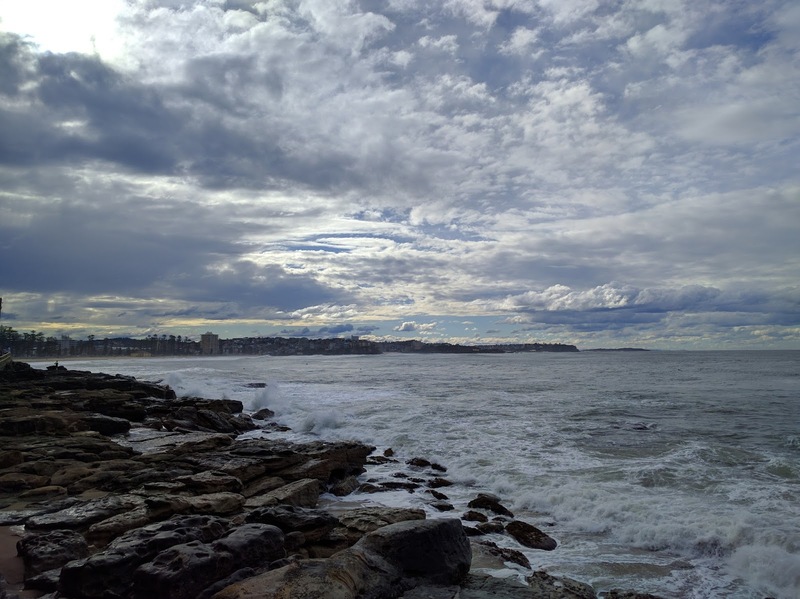 Although it was a tad messy as a result of the storm that hit Sydney, the beach was still beautiful. The waves were still a little rough and only a few surfers were present braving the waves. As I walked further up the coast line, the extent of the damage caused by the storm a few days ago start hitting home. I feel lucky to have the opportunity to see some of the most beautiful natural landscapes. 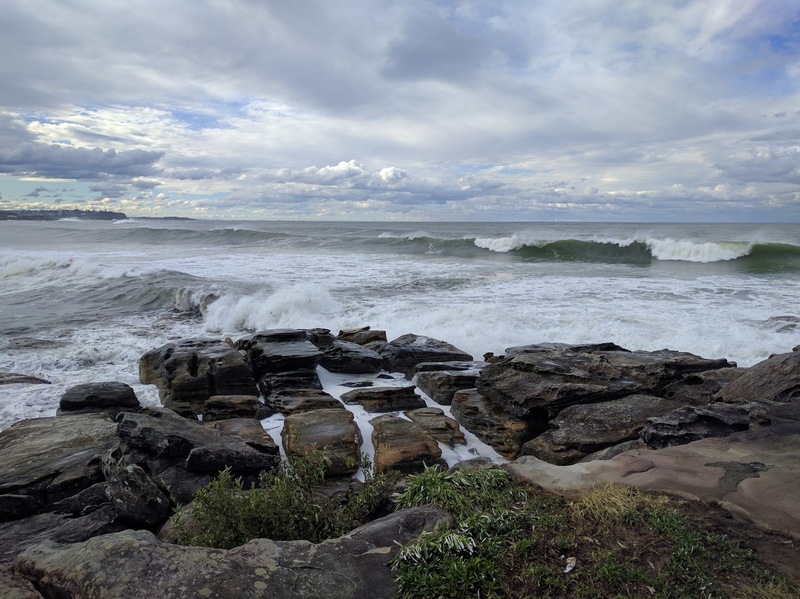 However seeing this first hand also lets me appreciate just how destructive nature can be. 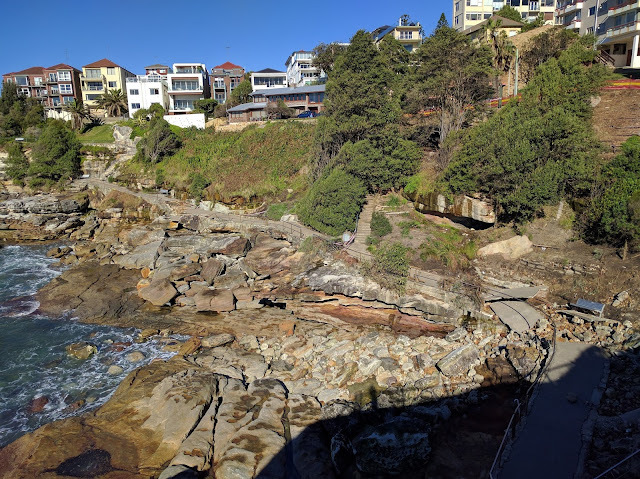 Aside from the damage to the roads, some of the houses on the coast lines were also visibly damaged. 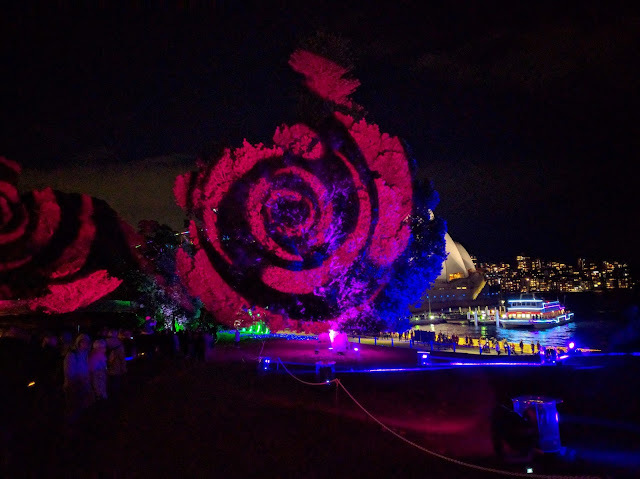 As the day came to a close I took the ferry back to Circular Quay, had dinner and opted to have a look at the light display at the Botanical Gardens (it was still closed yesterday due to damage caused by the storm). 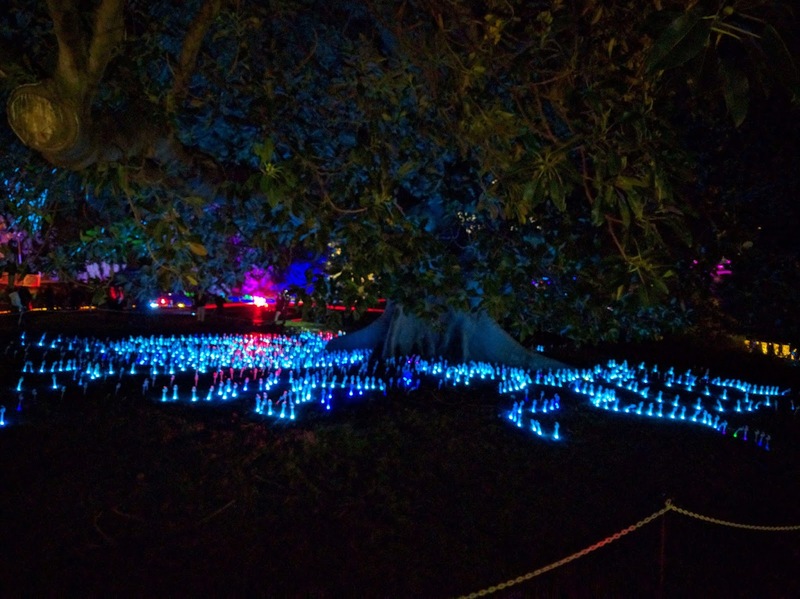 Just like the previous evening, the light exhibition in the botanical gardens was exceptional, and provided a different perspective with lighting focused on the trees as opposed to buildings. 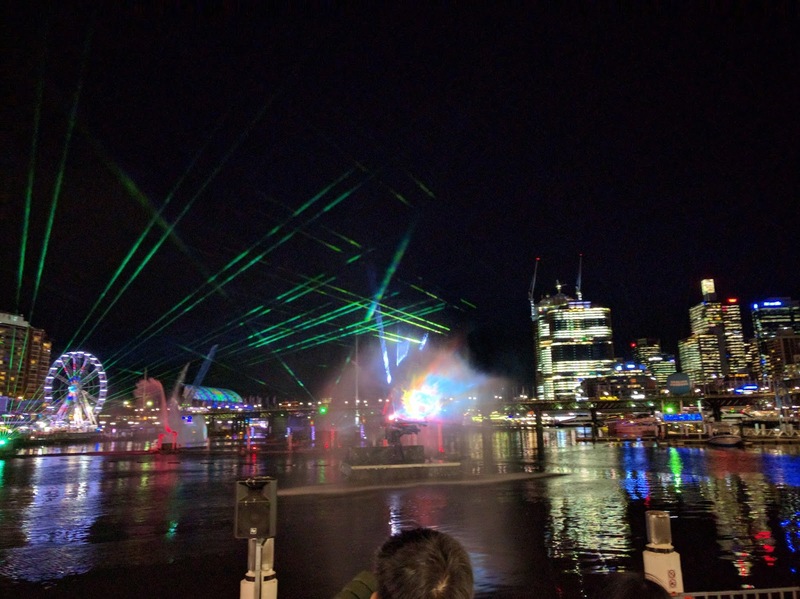 Aside from Circular Quay area, there are also some light shows in the CBD. 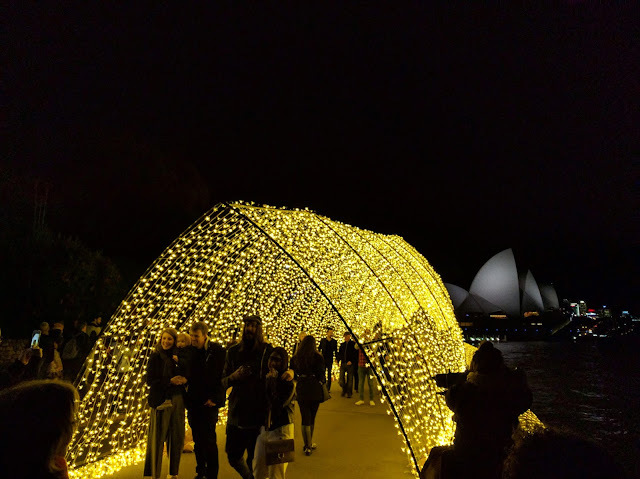 Although these were not as extravagant as the ones in Circular Quay, they were nonetheless still really nice and worth exploring. 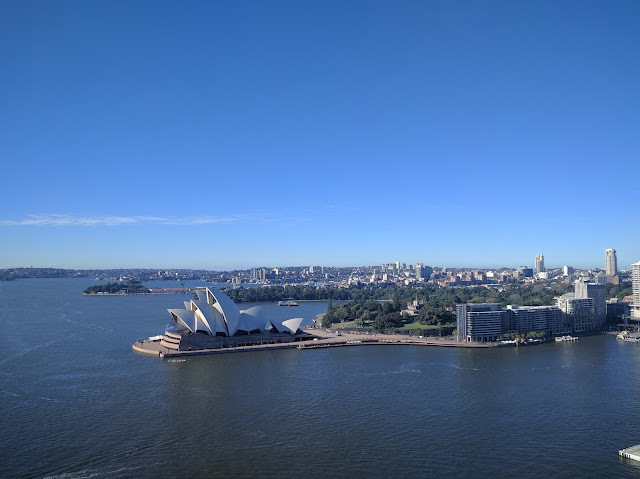 I spent the morning at Pylon lookout, and for only $13 was able to enjoy 360 degree views of the Sydney harbor. 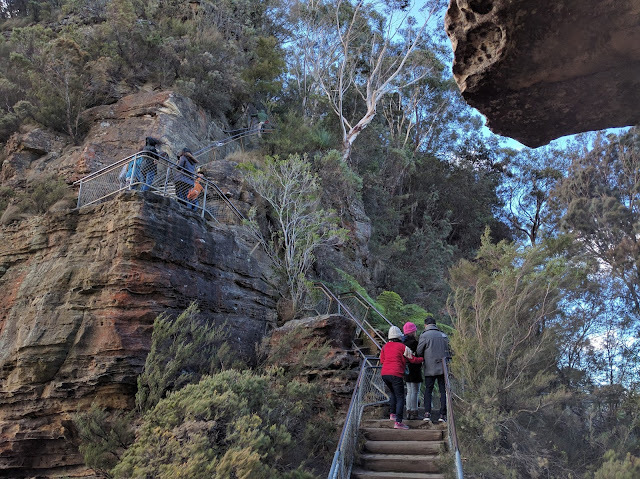 The lookout involves climbing 200 steps on stairs, which was a lot easier when compared to climbing the stairs at the Eiffel tower. 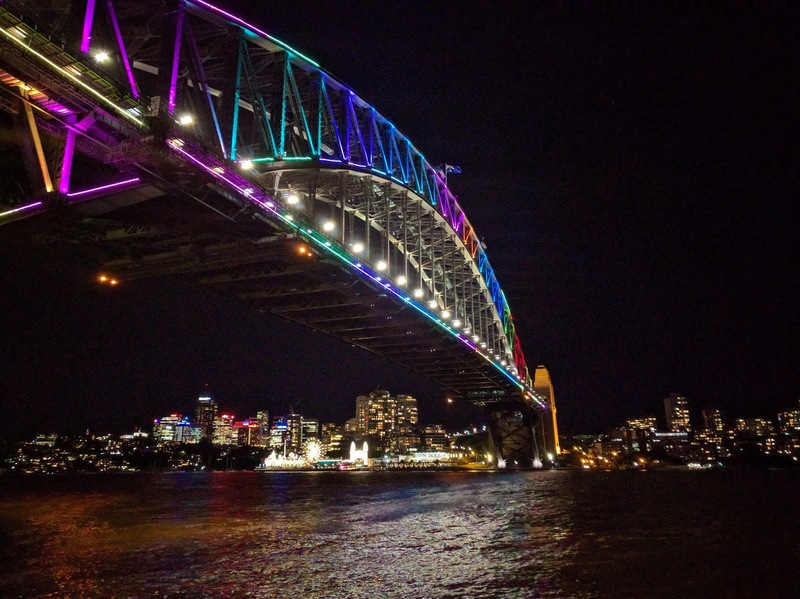 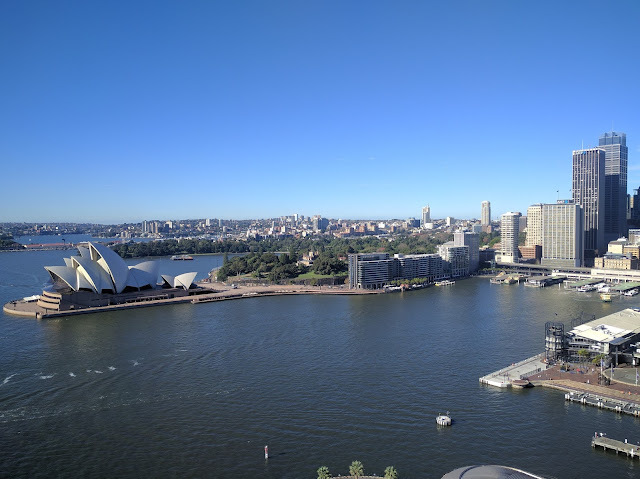 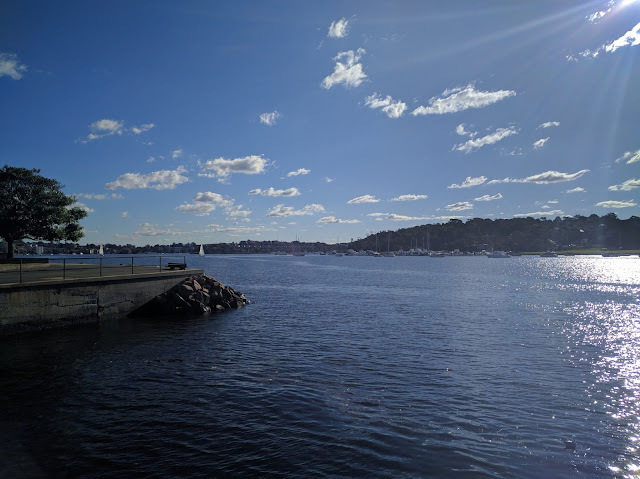 Though the primary objective for coming here was to enjoy the beautiful views of the harbor, the trip was complemented by learning about the interesting history on the birth and construction of the Sydney Harbor Bridge. 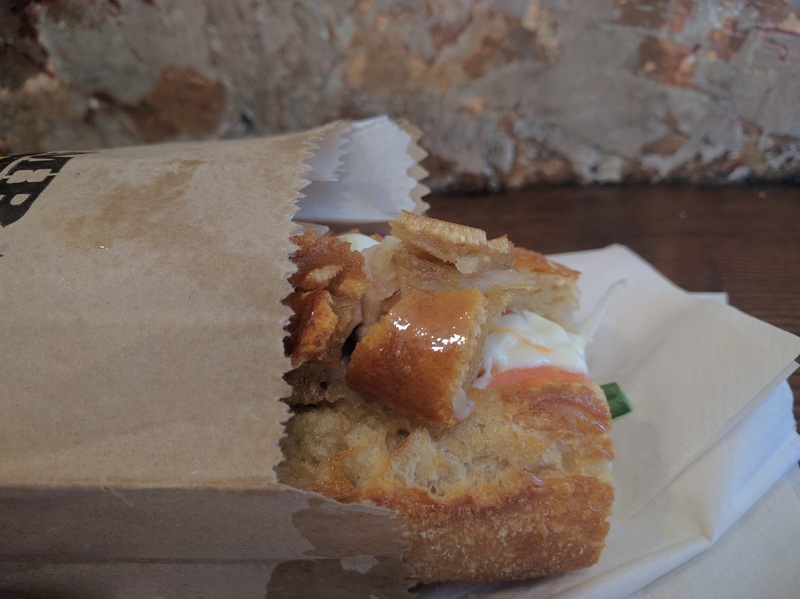 After I finished at Pylon Lookout, I took the bus to Darlinghurst to try out the pork belly roll from Mr Crackles which was amazingly crispy and certainly did not disappoint. In the afternoon, I joined the I am free walking tour which was a very enjoyable experience. 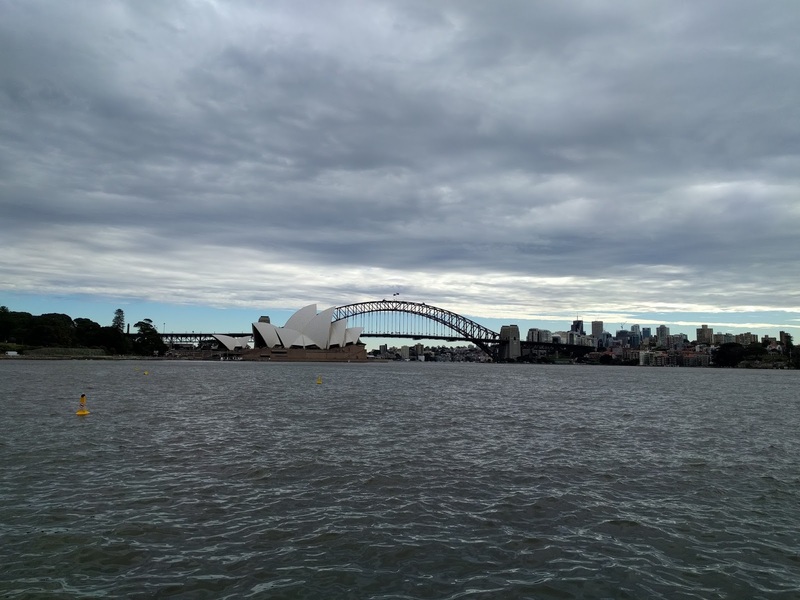 Our guide was very knowledgeable and took us around Sydney with a lot of energy. 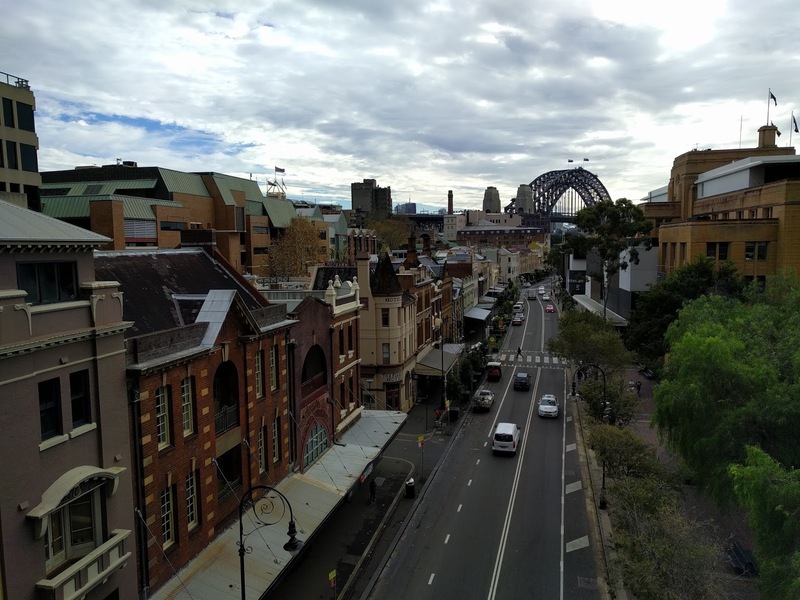 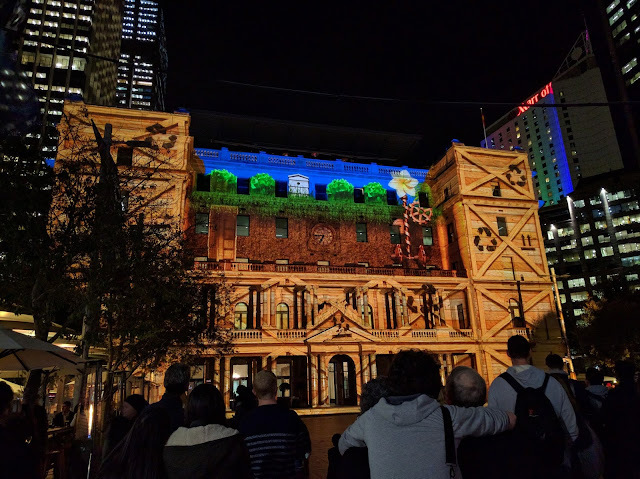 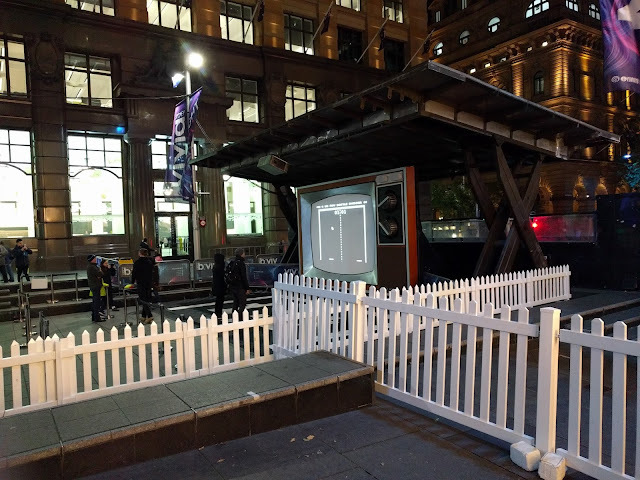 The tour starts at the town hall and finishes at circular quay and provides a great overview on the history of Sydney as well as awesome tips on getting the best out of the time spent in Sydney (especially for those on a budget). 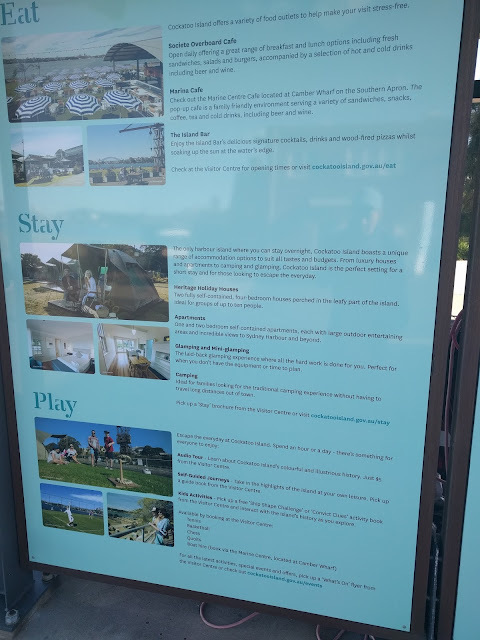 Some of the tips, I had already read about, but there were other tips that really helped me for the rest of my trip e.g. 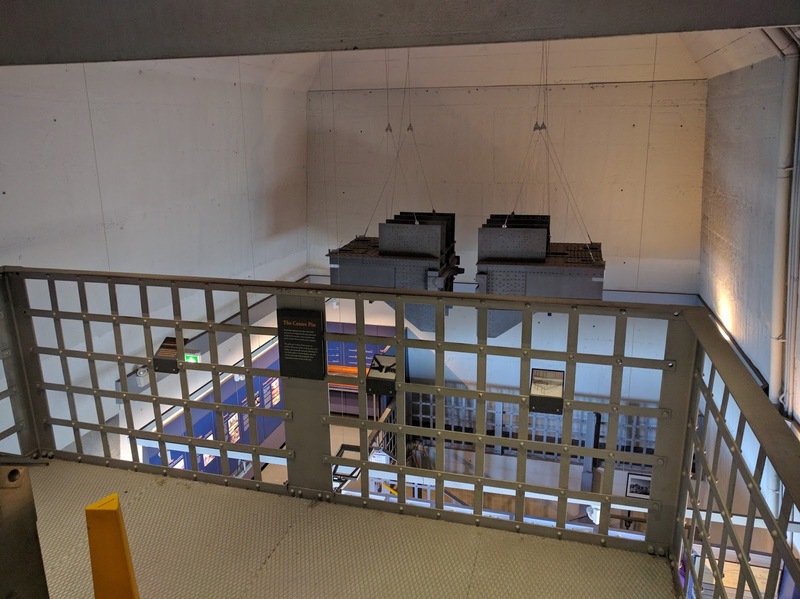 I originally intended to go up the Sydney Tower, but opted not to after our guide suggested that it was a little over-rated and not worth the money. 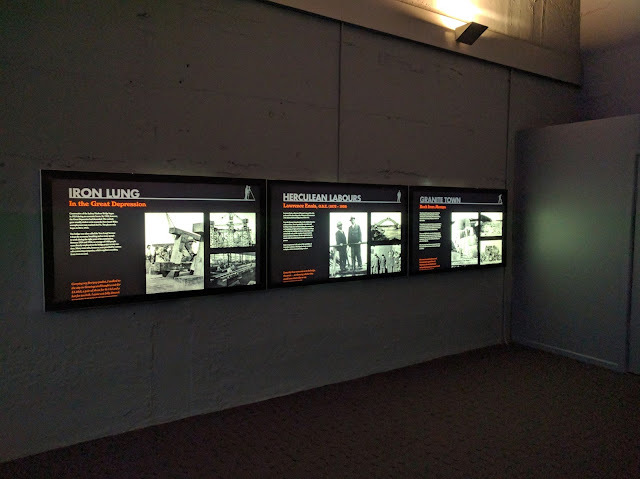 Another awesome thing about joining a tour is that you get to see places that you may not have originally seen e.g. 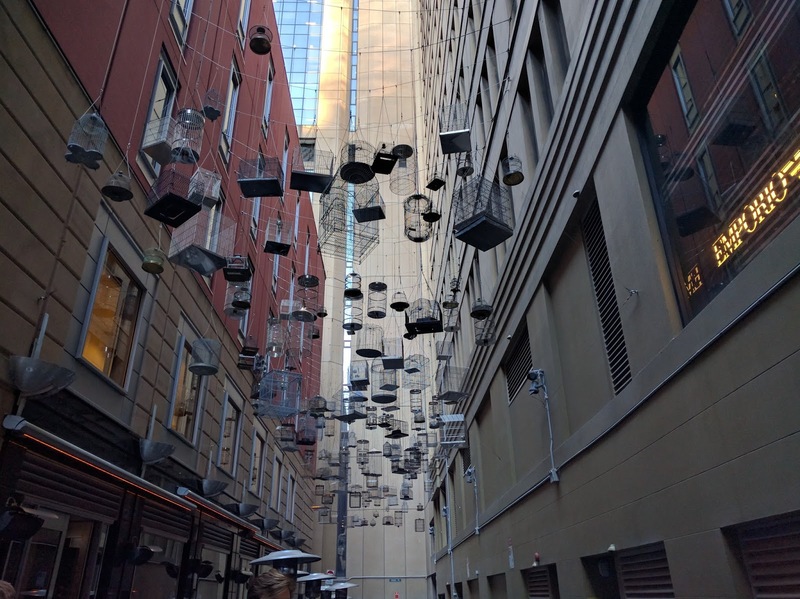 bird cages at Angels Place where the street has the beautiful sound of birds and overhead there are empty bird cages used to represent native birds that used to inhabit Sydney. 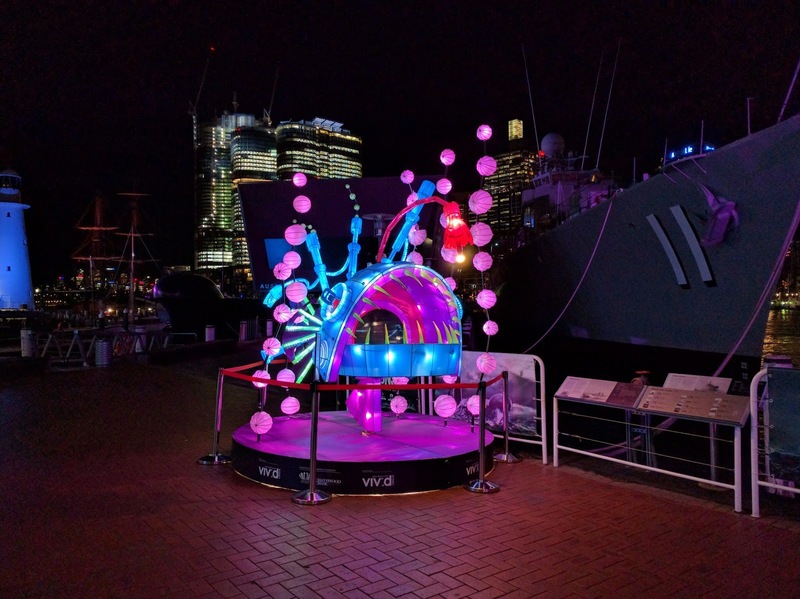 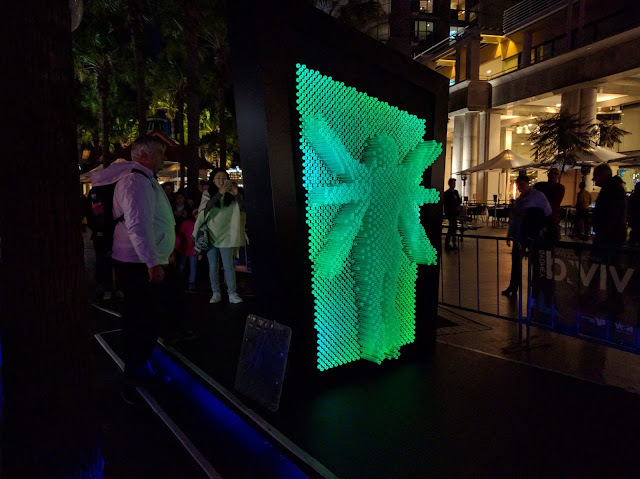 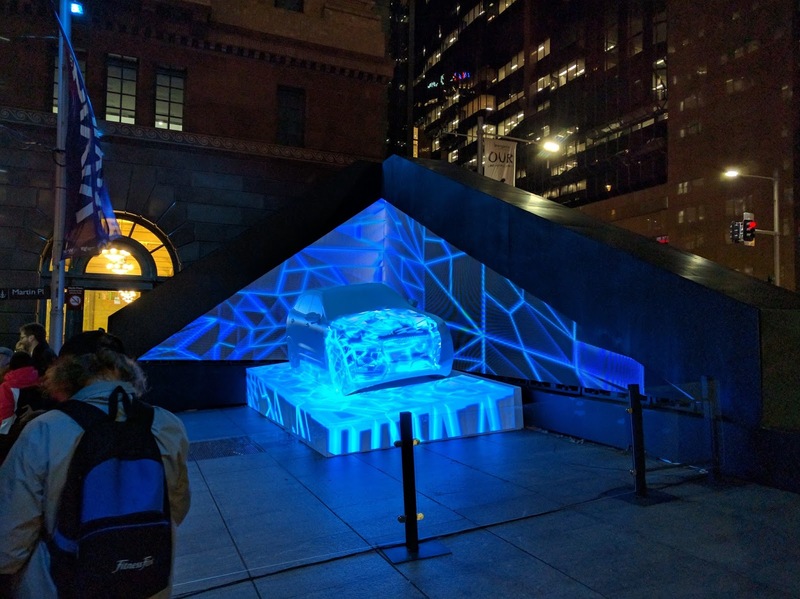 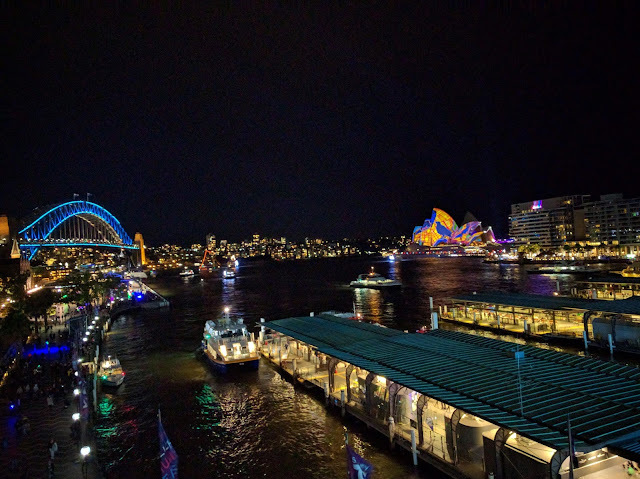 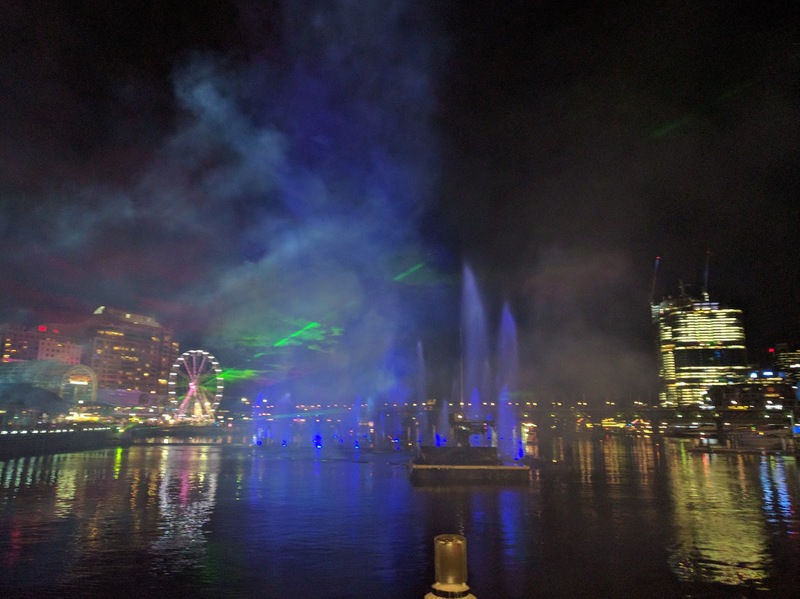 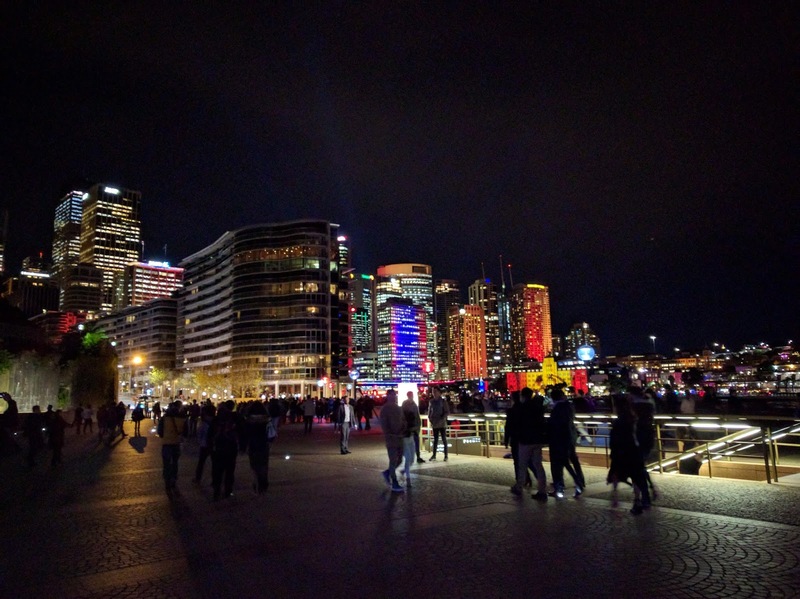 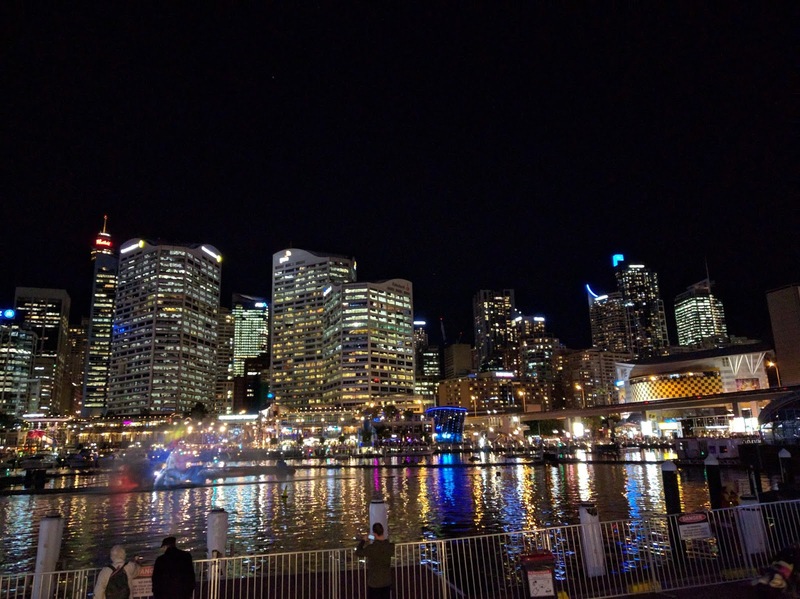 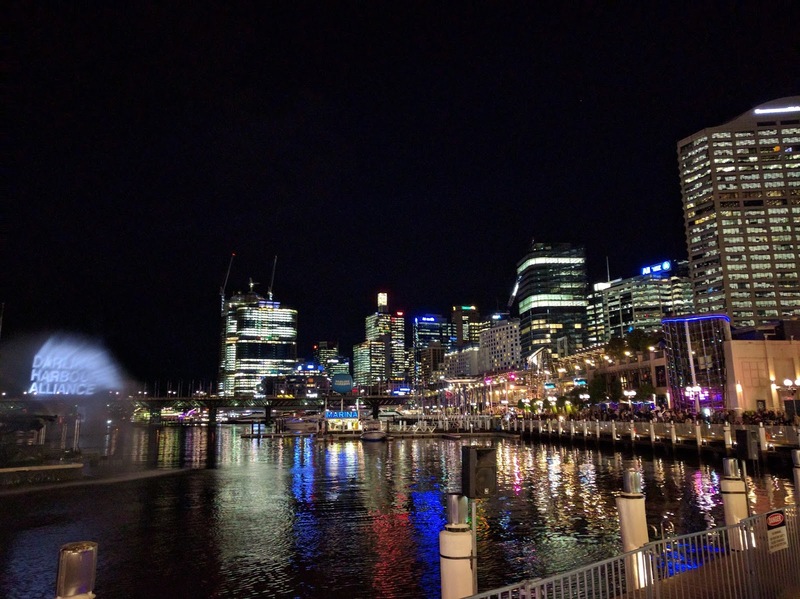 In the evening, I visited the Vivid Sydney show at Darling Harbor which very extravagant and without a doubt one of the most stunning night scenes I have seen. 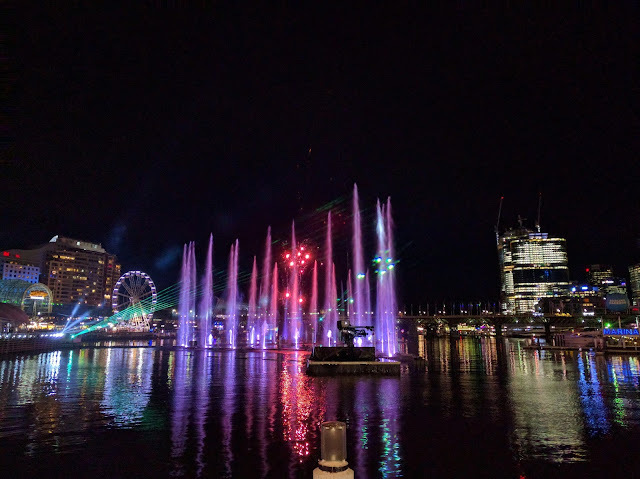 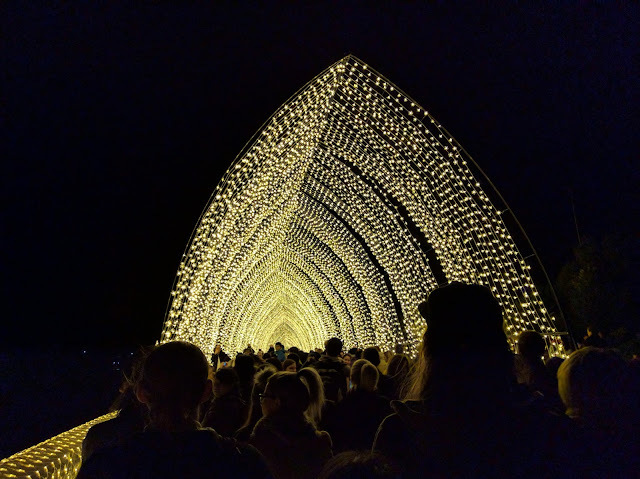 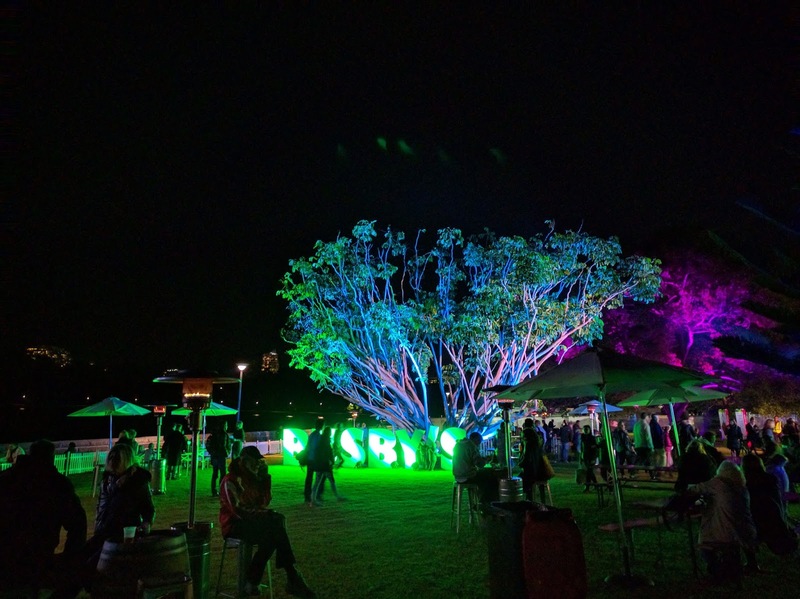 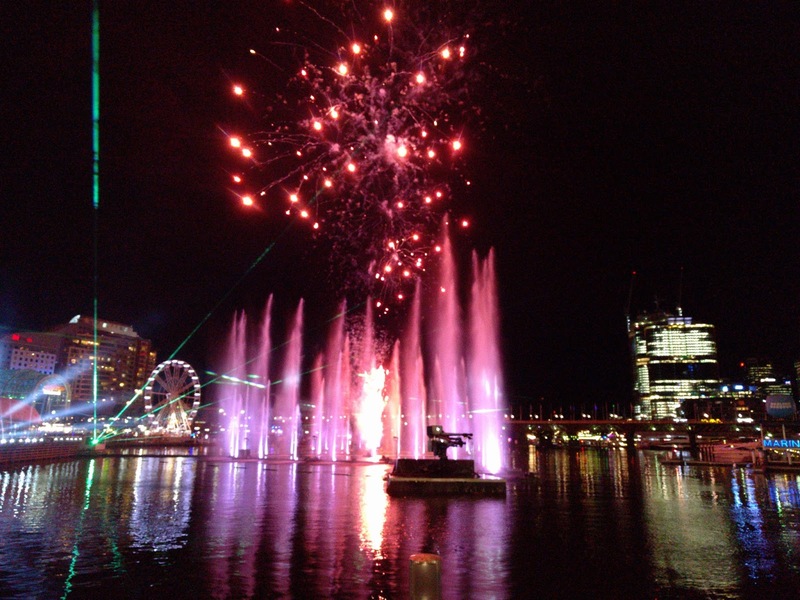 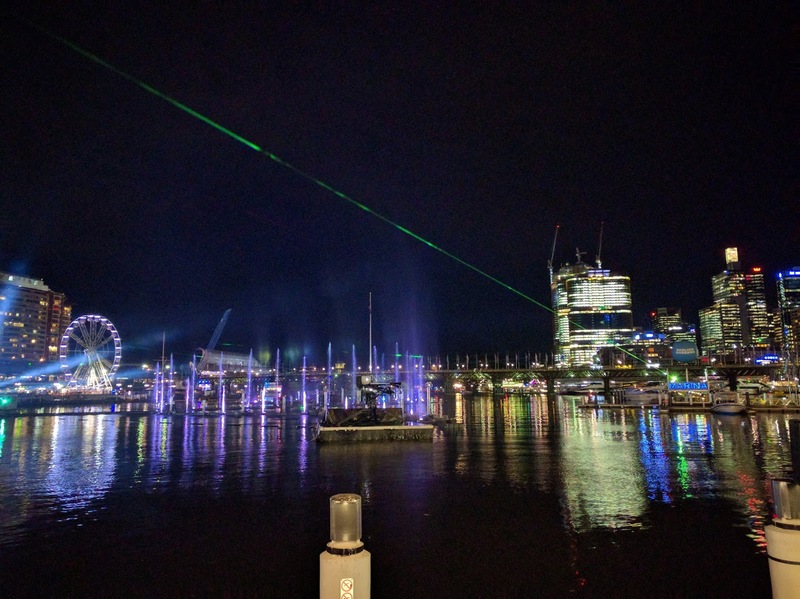 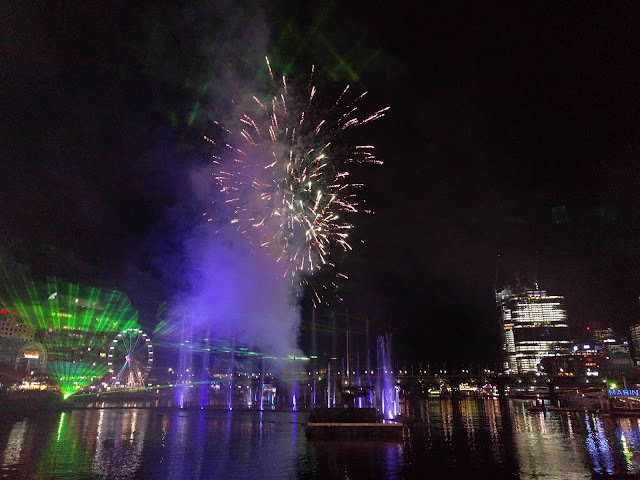 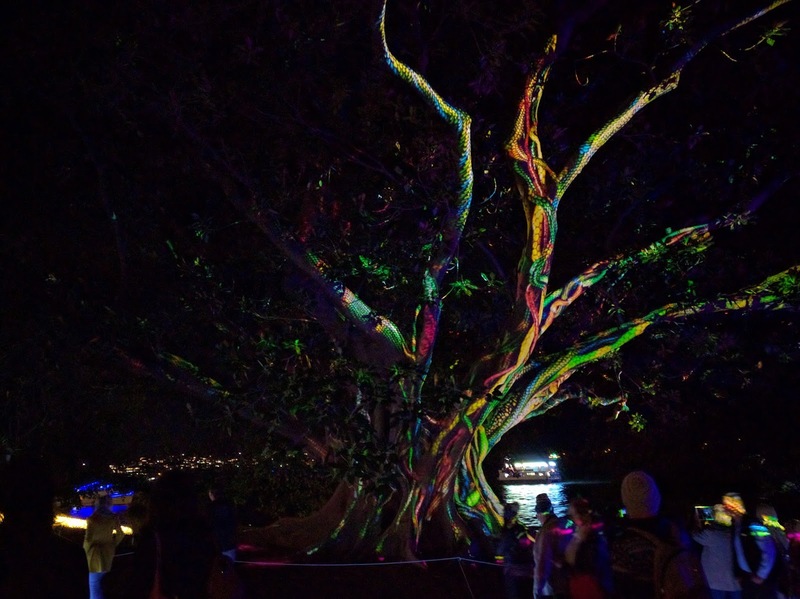 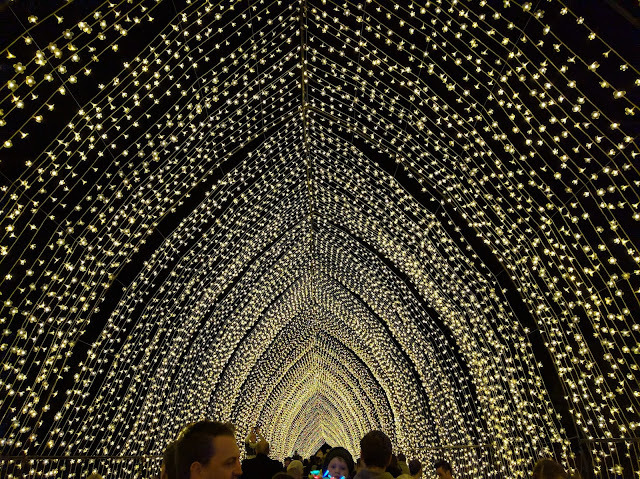 It is worth noting that although the light show itself occurs relatively frequently during the Vivid Sydney festival (I think every 20 minutes), the fireworks only occur a few nights a week, and usually just once once at night. 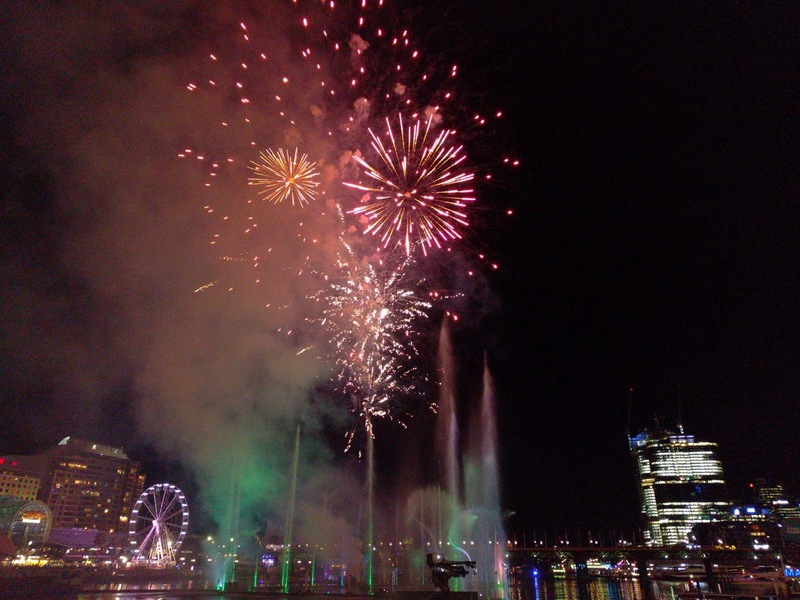 Good planning is recommended if you want to see the light show together with the firework display. 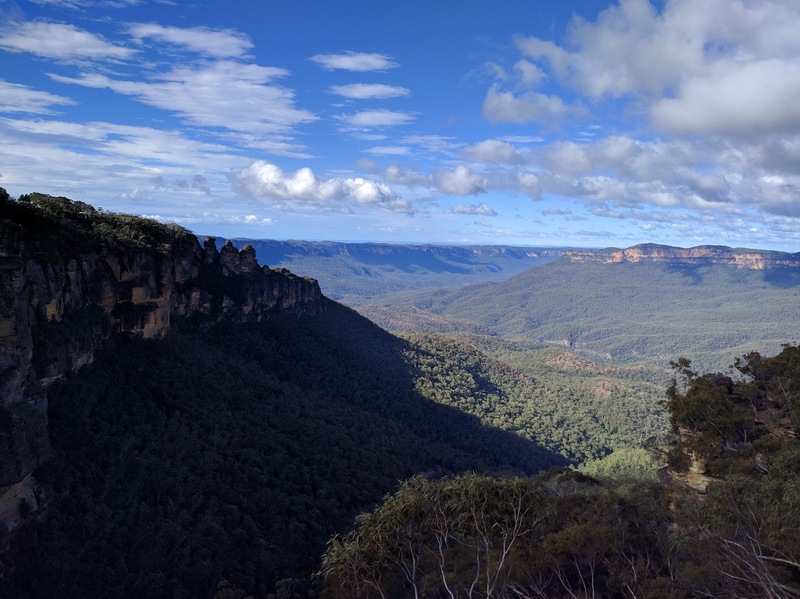 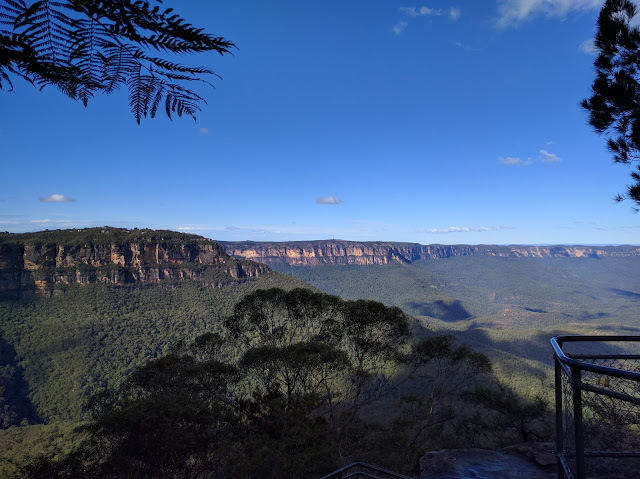 Today I got up early to take the 2 hour train ride (Blue Mountain line departing 6:50am from Central Station) to the Katoomba station at the Blue Mountains. 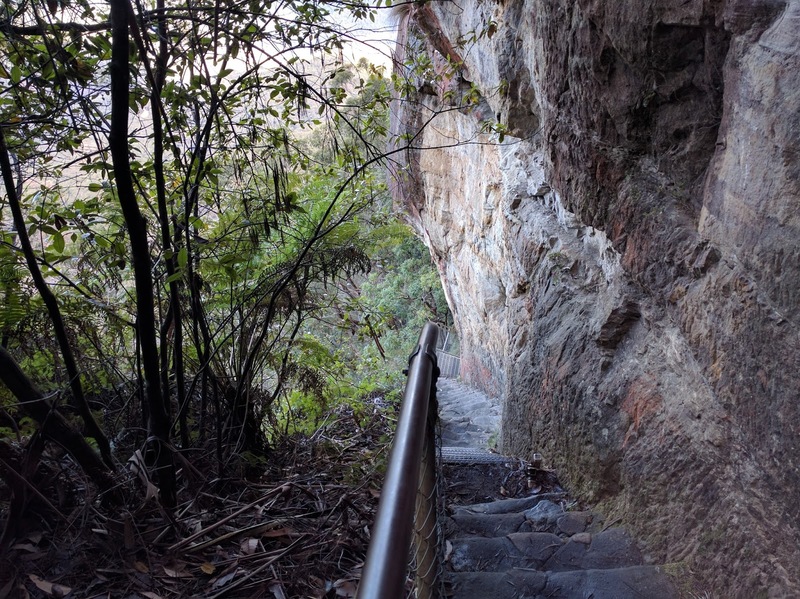 After I arrived, I took the bus #686 from outside the train station to Echo Point. 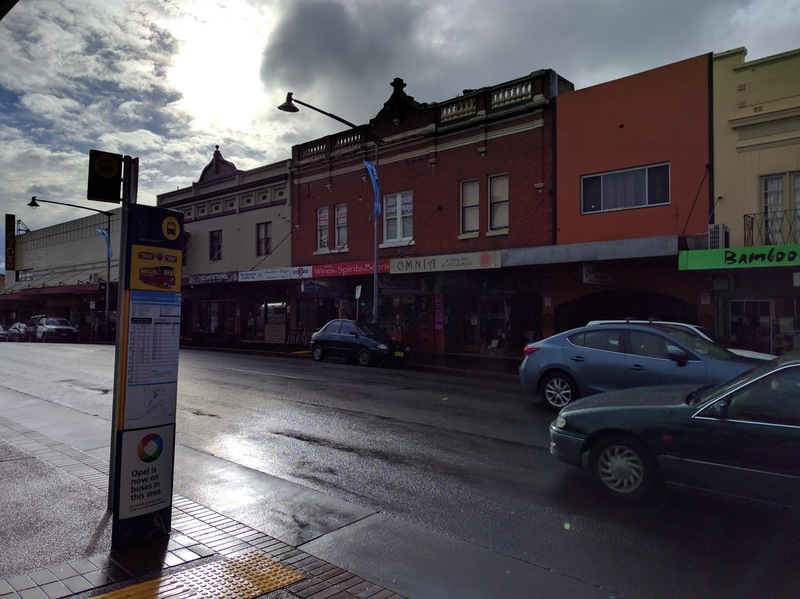 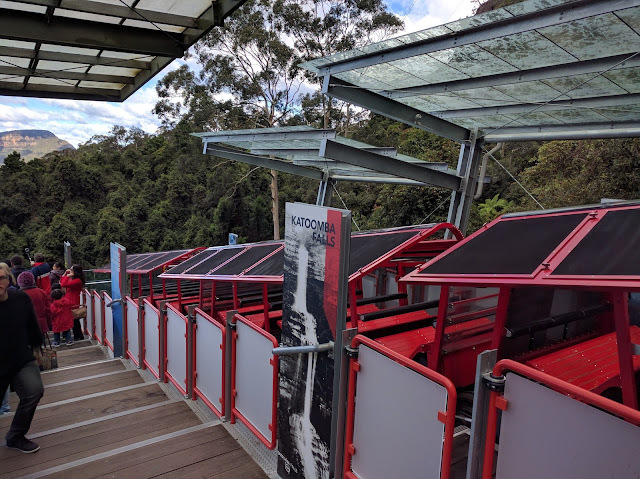 Bus 686 is a great alternative if you want to save money from buying a hop on hop off ticket for the tourist bus, and if you have spent enough on your Opal to get free trips, then the train ride to Blue Mountains and the bus around town would also have been free. The views from echo point lookout were simply beautiful and spent a short time there before taking the bus to Scenic World. 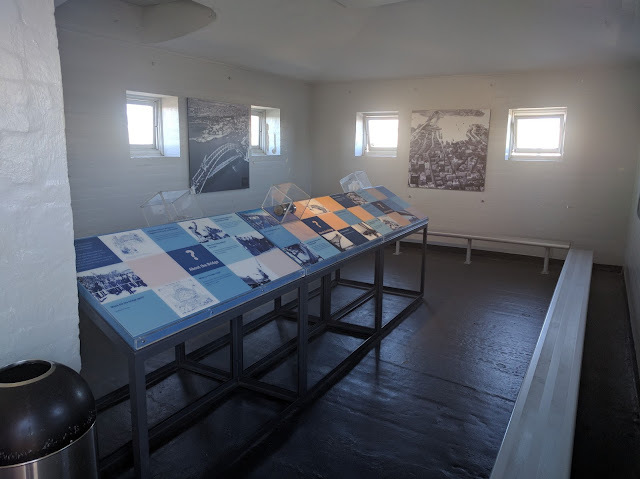 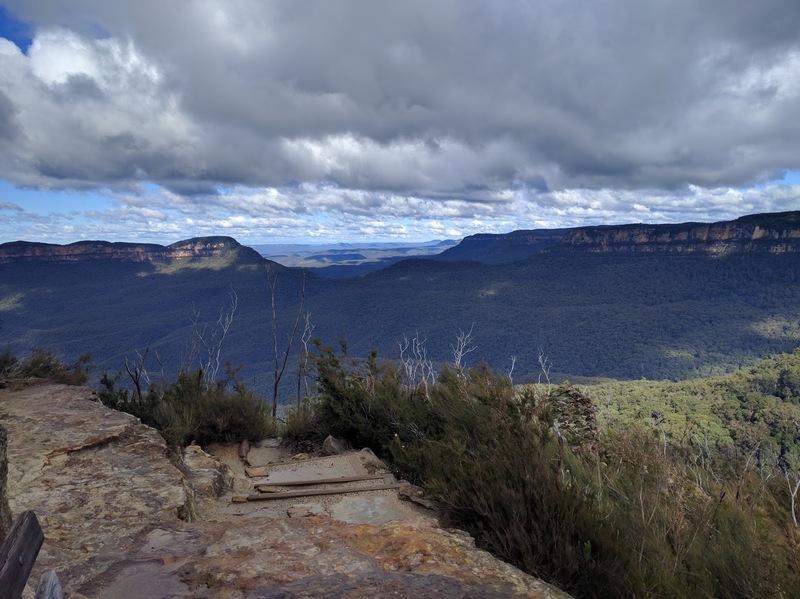 If you are planning on doing some hiking in the tracks, then I would recommend going to the information center at Echo Point, buy a map there and get some advice from the friendly staff. Although you can buy the ticket from Scenic World's website, it charged a few dollars of administration fees, and so I decided to buy my ticket from the reception at Scenic World. 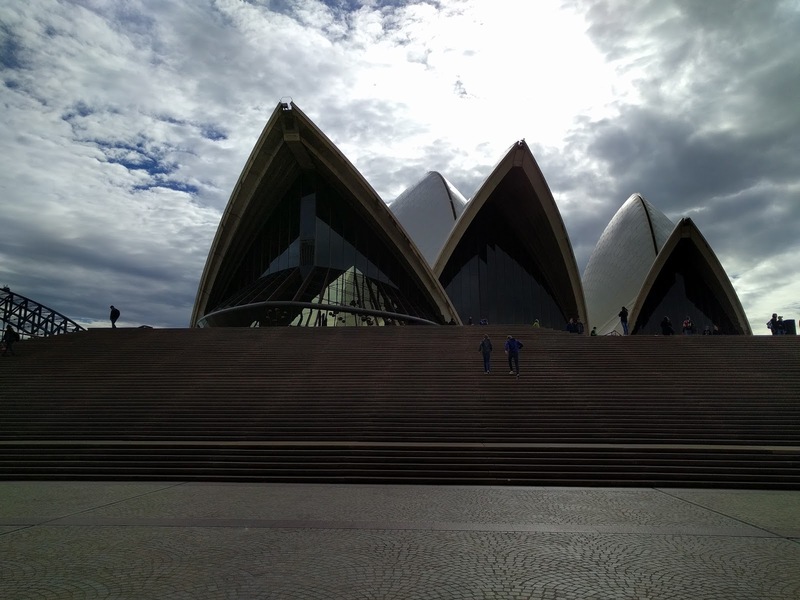 Luckily there wasn't much of a line as I arrived early and the weather wasn't too flash during that time. 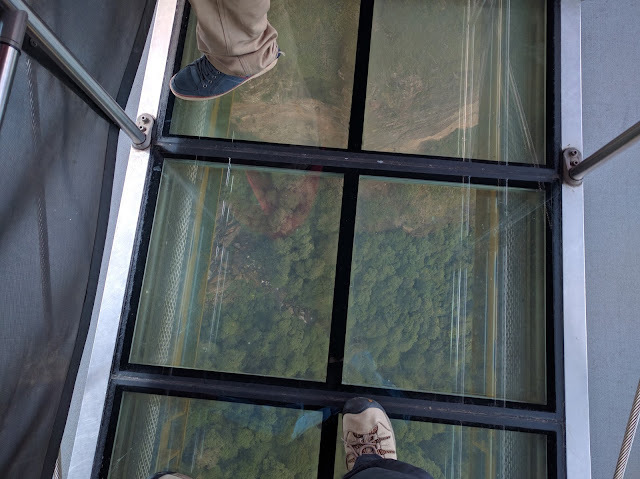 First up, I went on to the Skyway, the unique part of this car is the glass floor in the middle which allows you to look down. I spent some time on the other side enjoying the views and taking a short walk at the tracks there before taking the car back to Scenic World. Next up, I went on the Railway which is apparently one of the steepest passenger railway in the world. 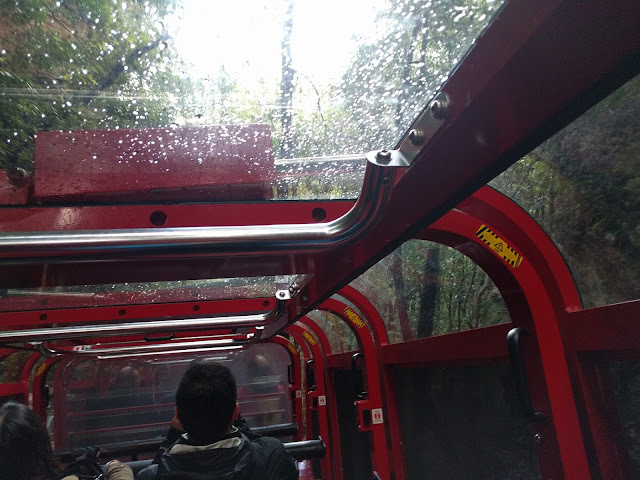 I thought the ride would have a lot more adrenaline, but it wasn't very thrilling ride, and there wasn't really much of a view on the way down. 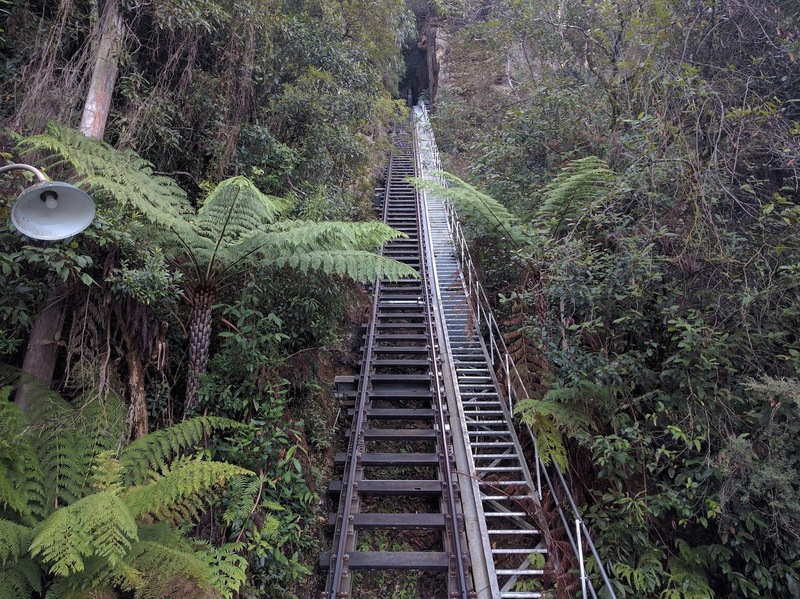 At the bottom of the railway I took the opportunity to enjoy the walking tracks. 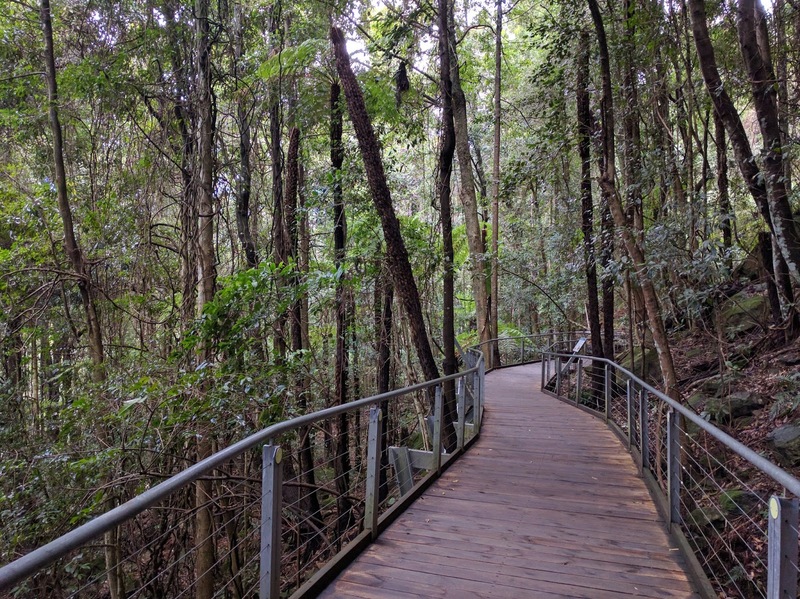 The rain forest provides a really tranquil environment and was a great chance to recharge mentally. 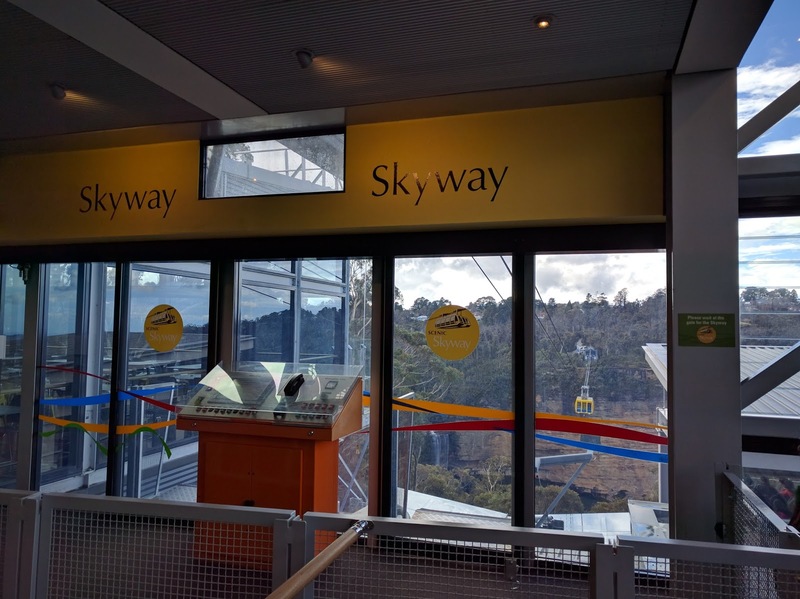 There are three routes available and all three will keep you occupied for about an hour. 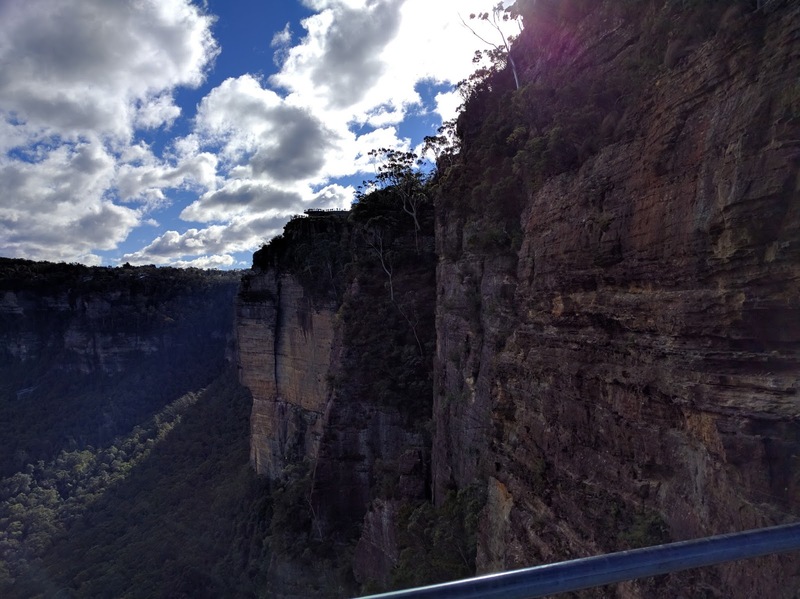 I finished things off by going on the cableway which provides nice views of the blue mountains. 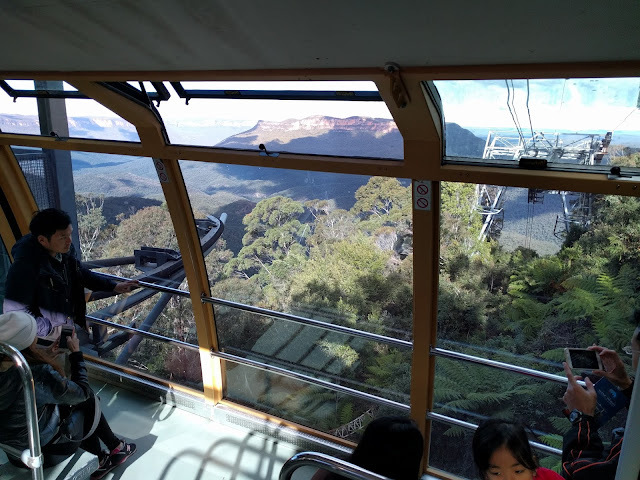 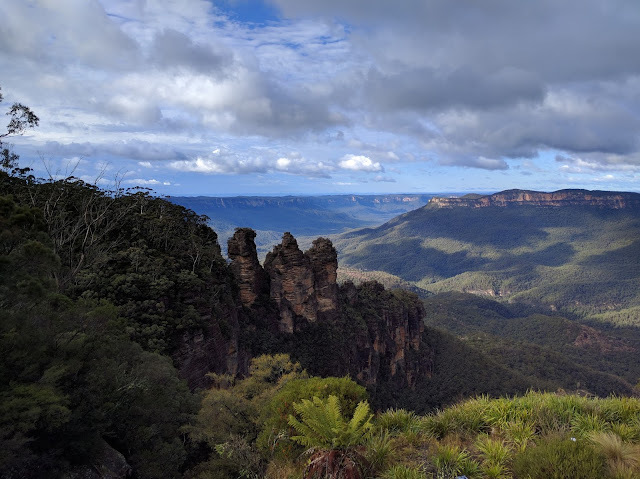 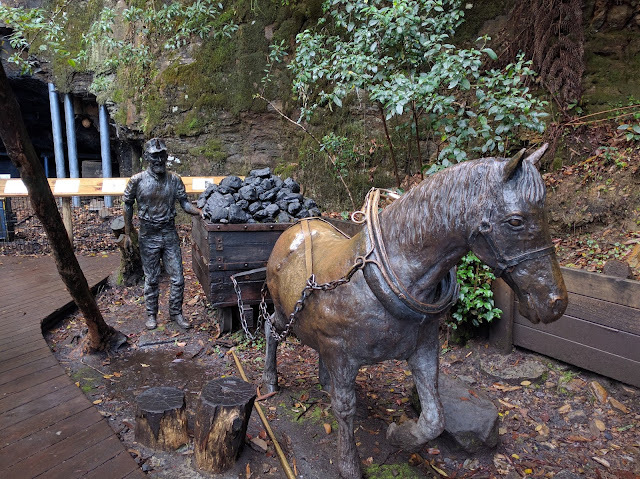 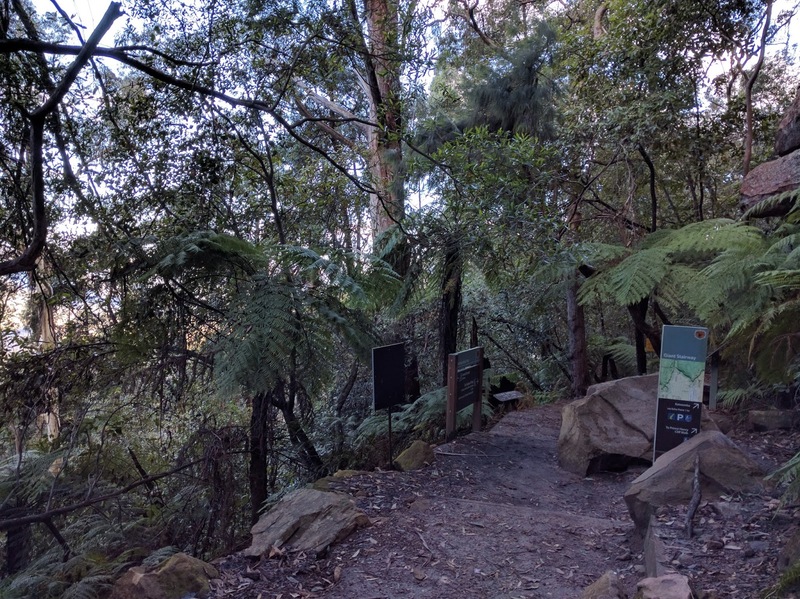 The thing I loved about Scenic World is the friendly and energetic staff driving the skyway and cableway, as well as the very peaceful and tranquil walking tracks. After Scenic World, I decided to head back to Echo Point and walk down the giant stairway to get up close with the three sisters. 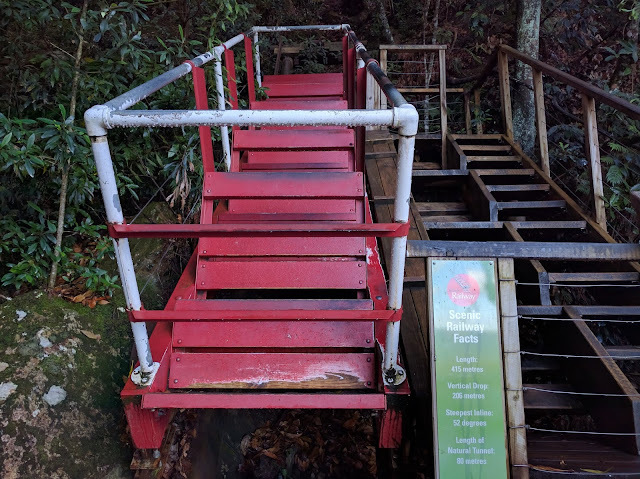 I've read about the giant stairway, and the stairs were definitely really steep, and was slippery as it was raining during that day. 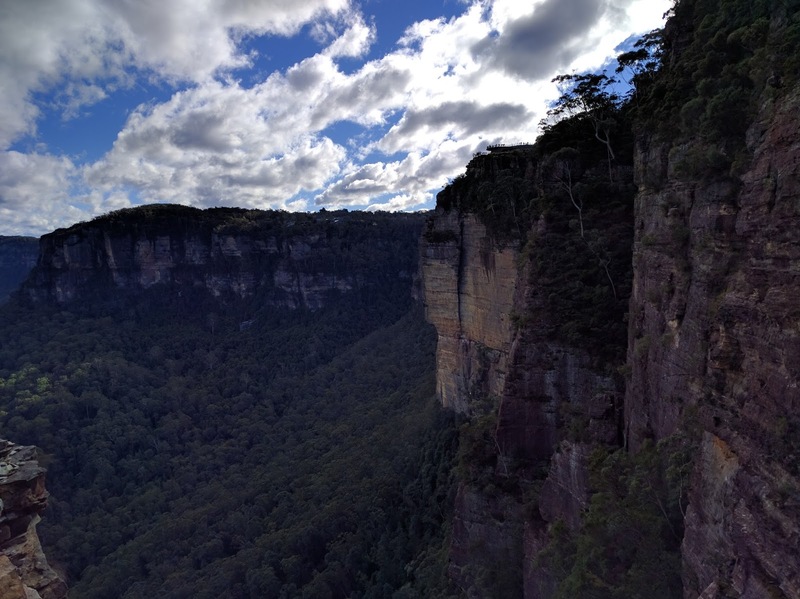 Nonetheless it was quite rewarding as you are surrounded by stunning views. 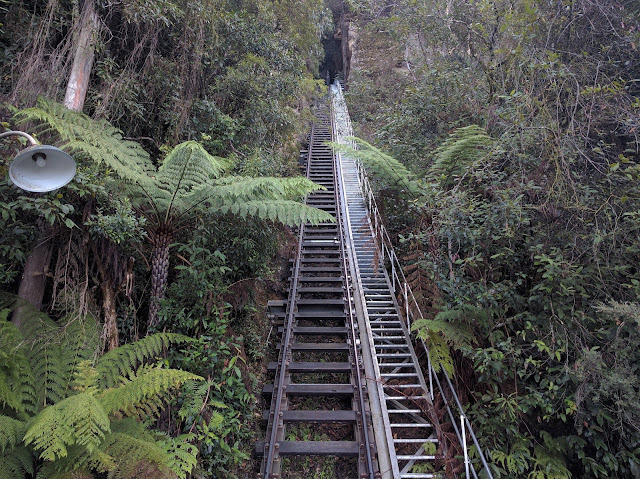 After walking back up the giant stairway I got on the train for the 2 hour ride back to Sydney. 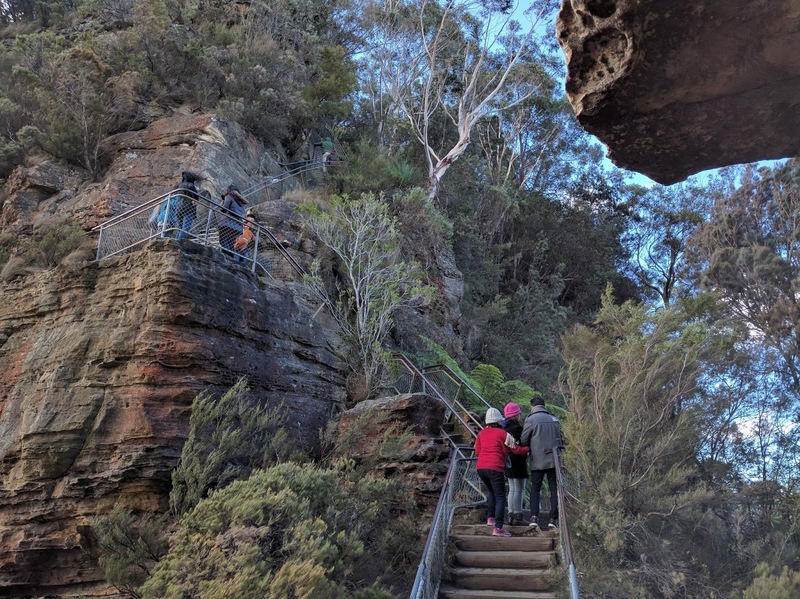 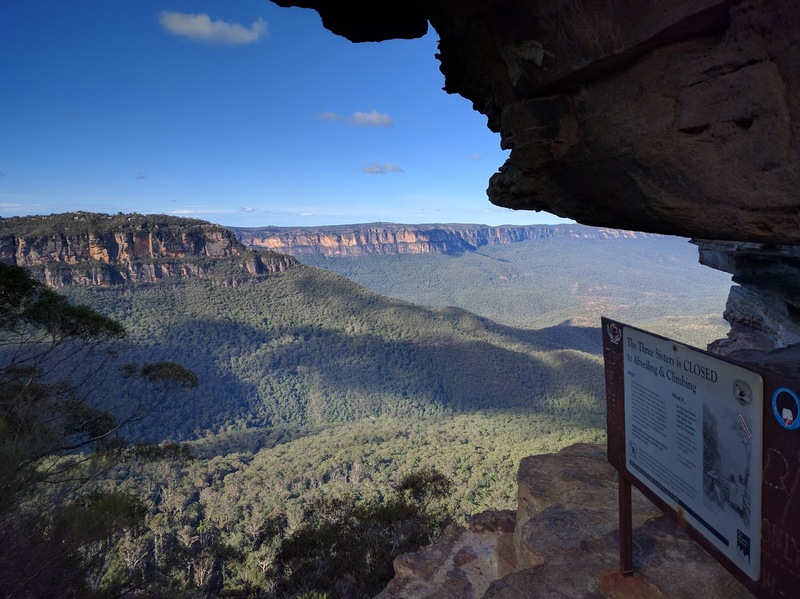 This day trip is certainly recommend for everyone who is visiting Sydney due to the unique experience and the ability to go out in to the wild and enjoy nature at it's best. Today was meant to be a chill out day, and I set out to do the Bondi coastal walk. 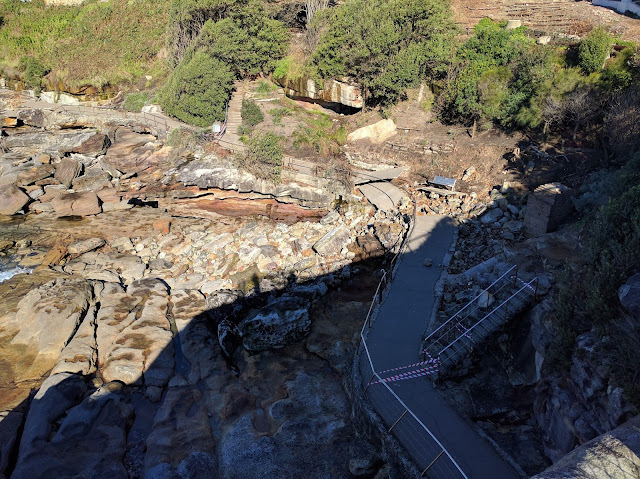 I took the bus to Bondi and arrived there to find that the coastal walk has been closed due to sever damage caused by the storm during the weekend. 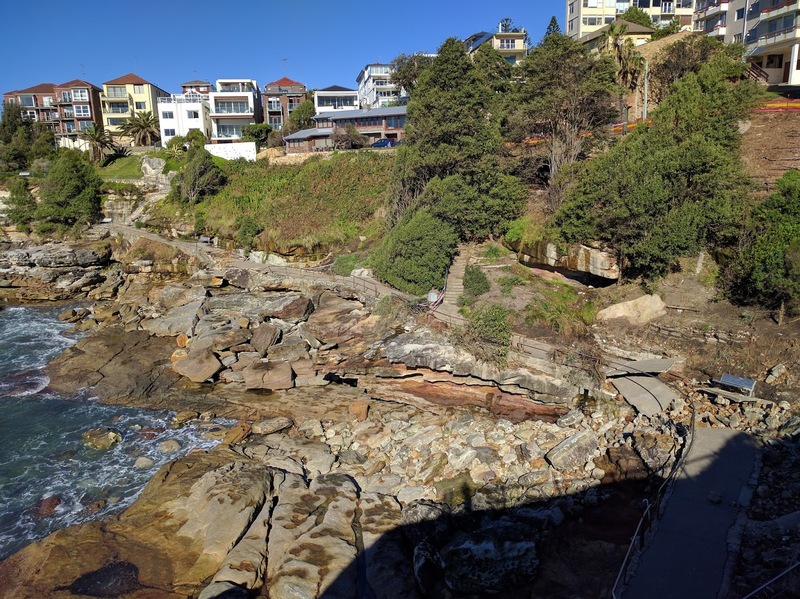 It is disappointing that the track has been damaged to such an extent, perhaps permanently. 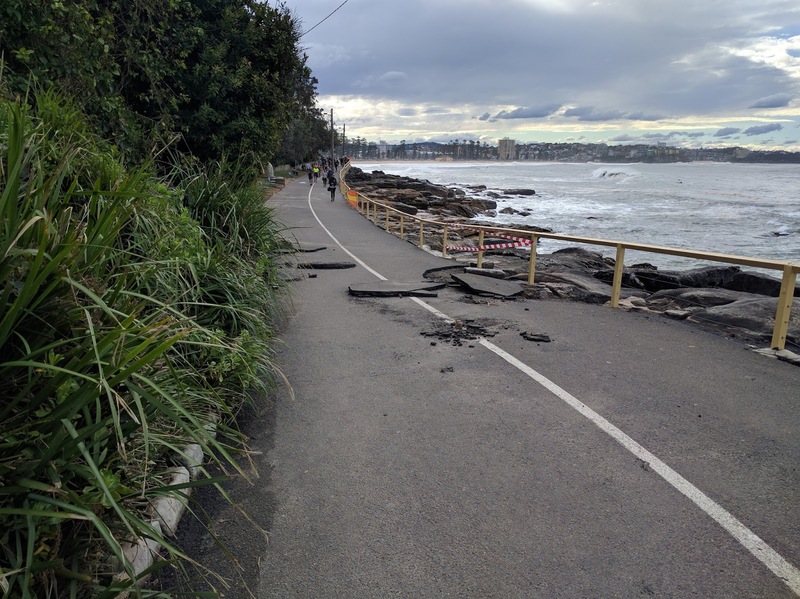 As I look around, the damage caused by the storm was still evident e.g. 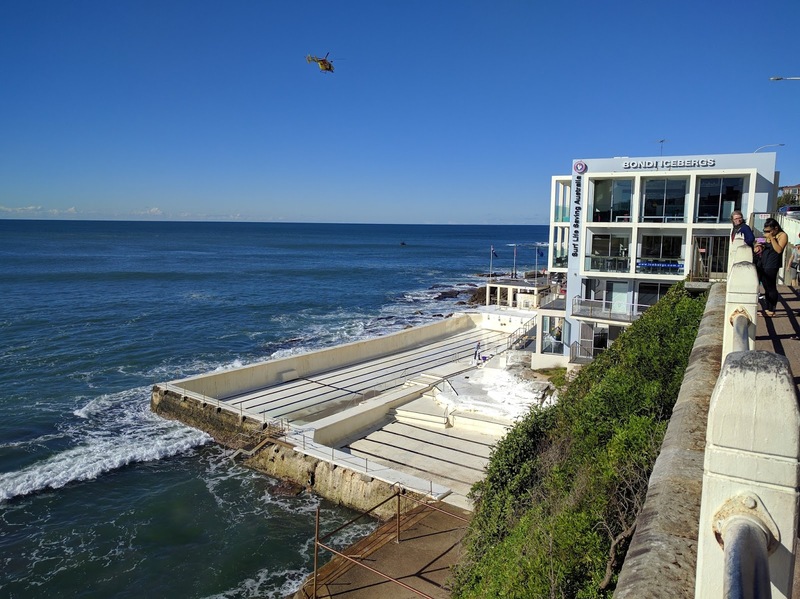 Bondi icebergs pool was still closed and being cleaned, however this hasn't stopped the surfers from making the most of the strong surf. 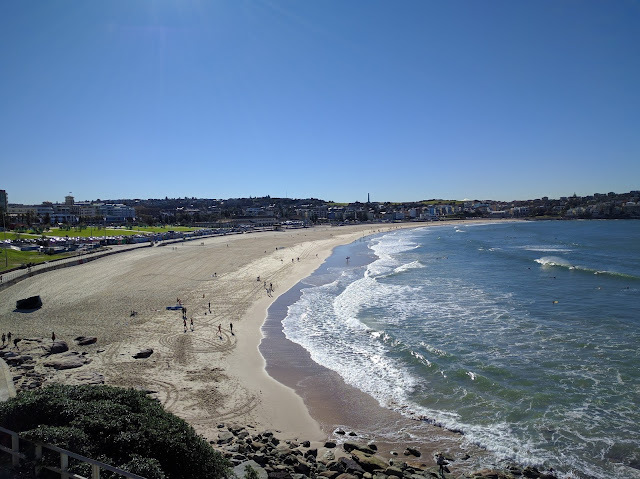 Somewhat disappointed at missing out on the coastal walk, I spent a short time at Bondi beach before heading back to the CBD to have lunch before making use of the free public transportation I earned on my opal card by going on a few ferry rides and exploring the surrounding areas of the Sydney harbor. 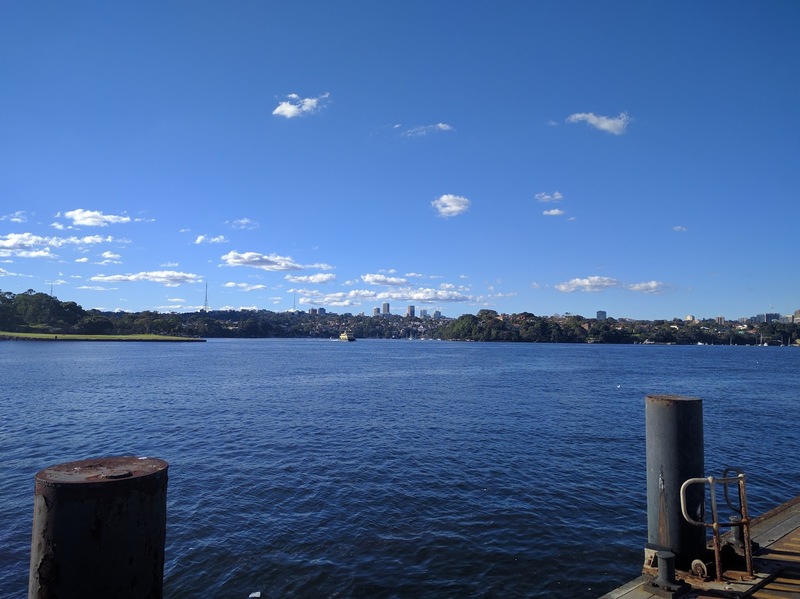 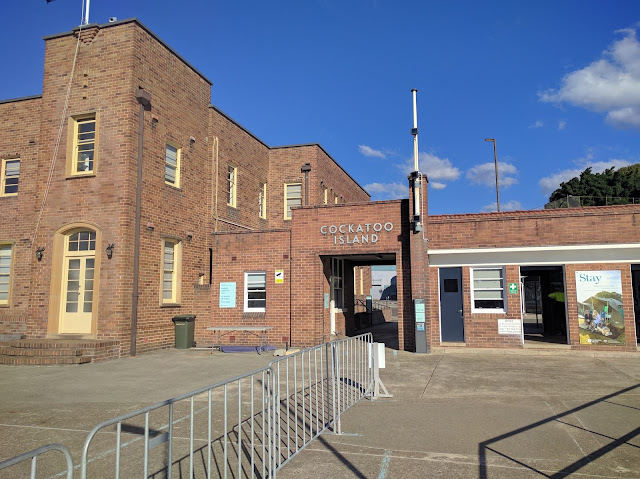 First up, is Cockatoo Island, and whilst I didn't stay long here as I didn't find the island too interesting, I was intrigued by the glamping styled accommodation here and I think it would be a nice way to get out of the city for an evening. 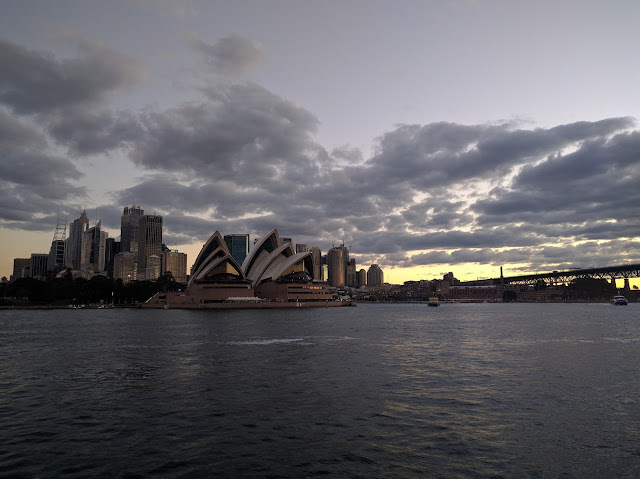 I got on the next available ferry and headed to Watson's Bay via Circular Quay. I have to say this is one of my favorite day trips in Sydney. Once at Watson's Bay, take the short walk to Watson's Gap for an amazing scenery. 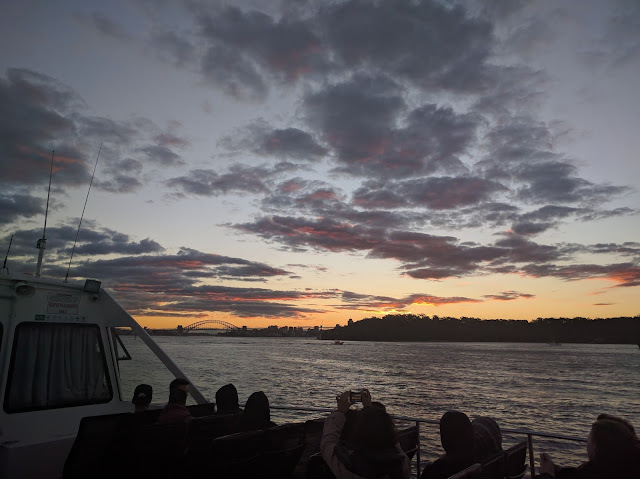 After enjoying the great scenery at Watson's Gap, I enjoyed a relaxing sunset ride on the ferry back to the city. 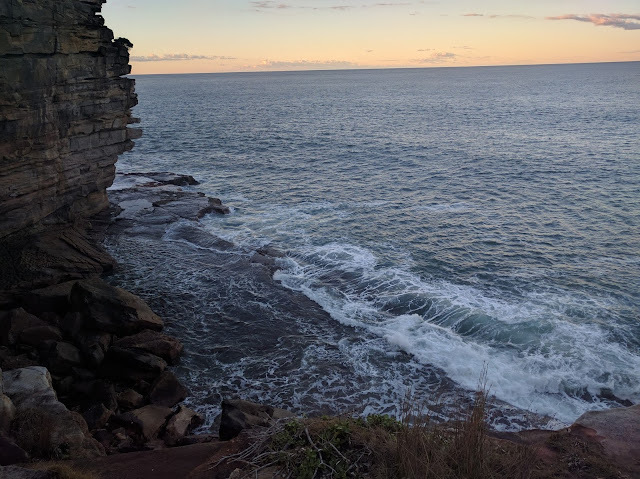 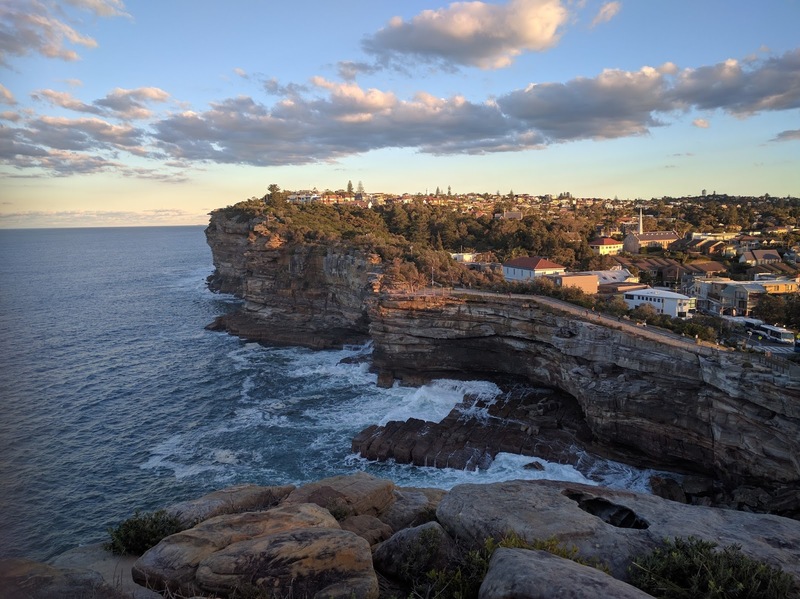 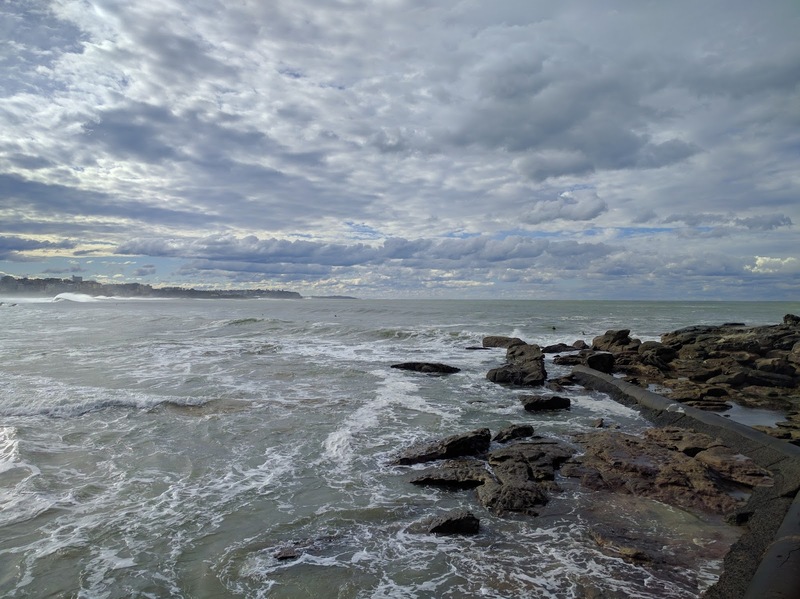 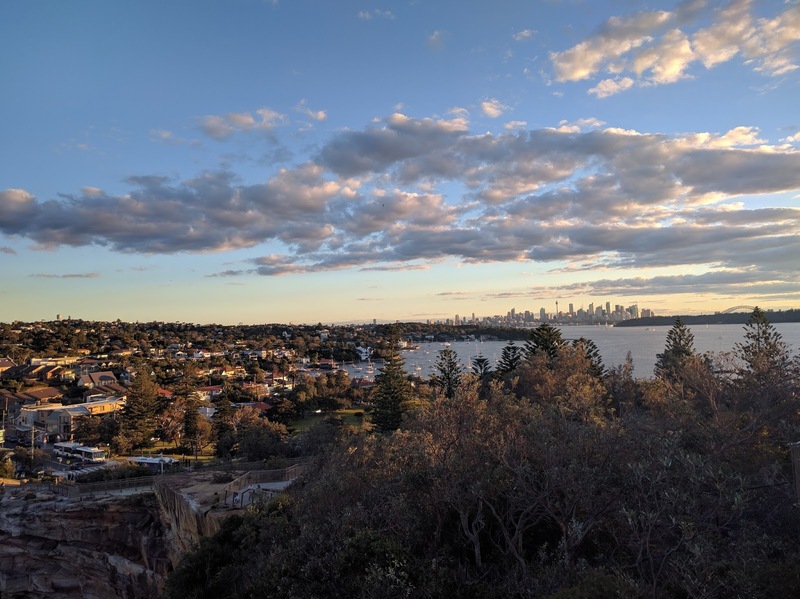 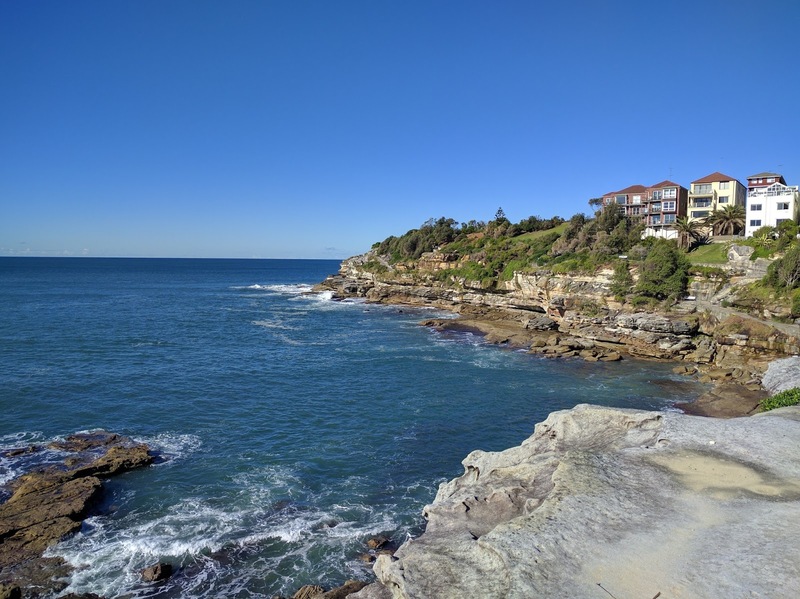 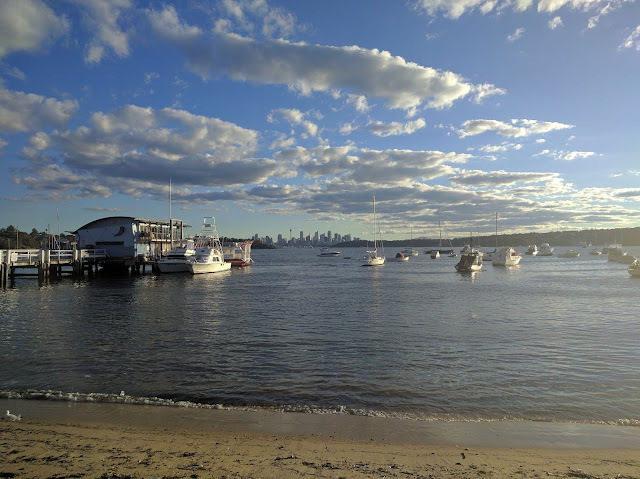 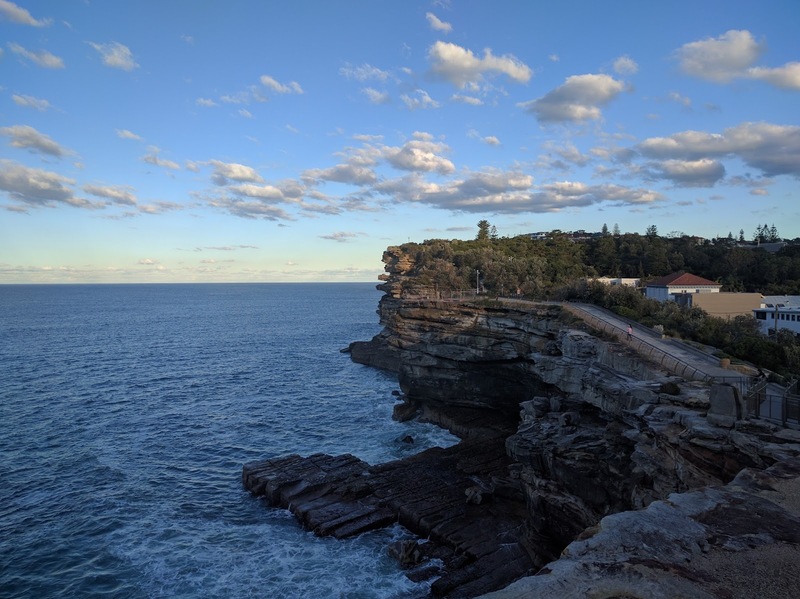 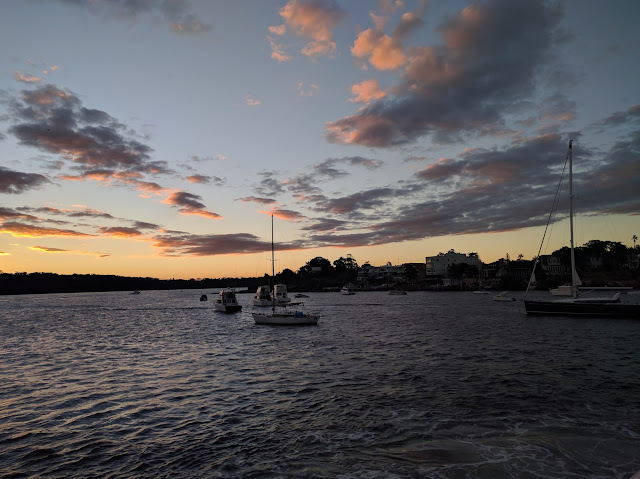 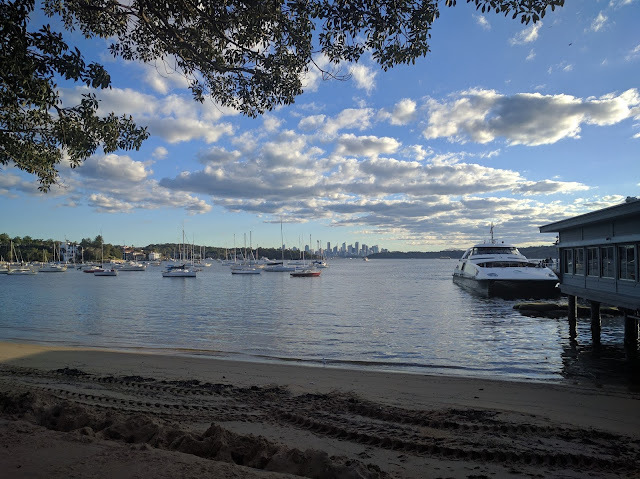 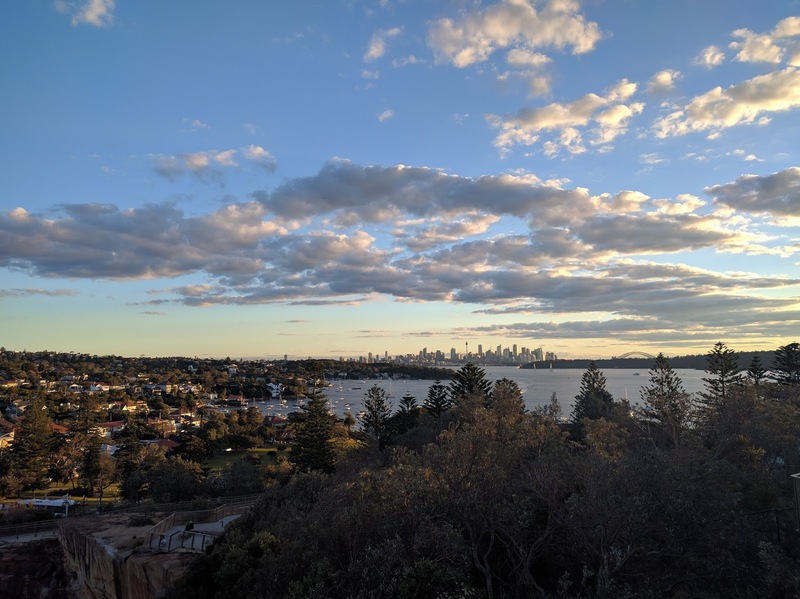 Whilst it was disappointing not to be able to go on Bondi's coastal walk, discovering Watson's Bay certainly more than made up for the disappointment. 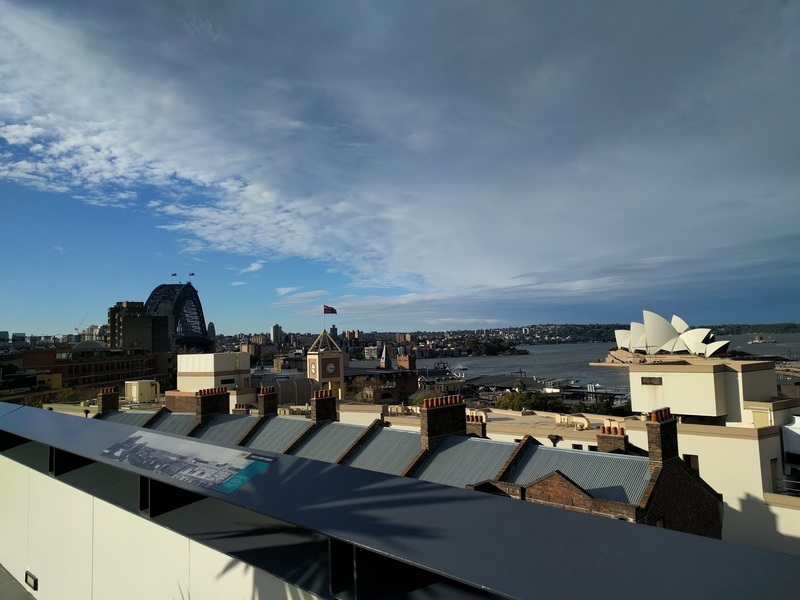 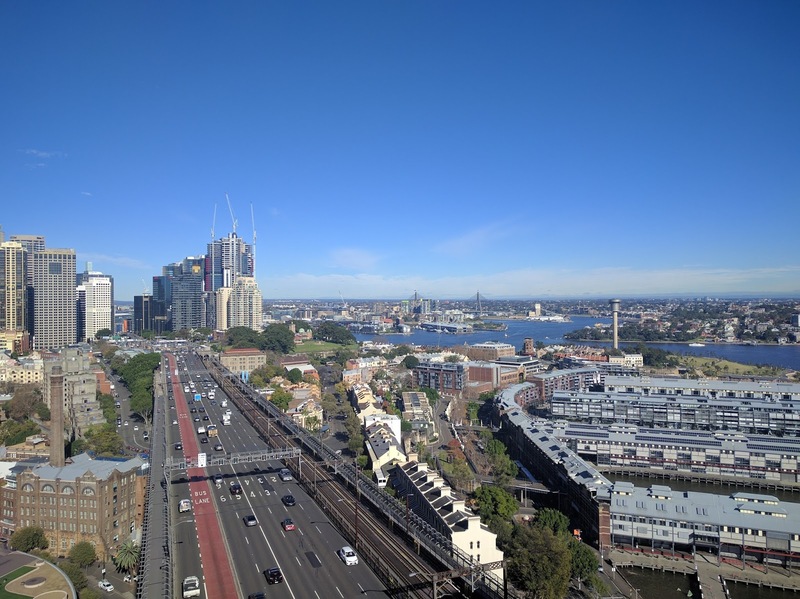 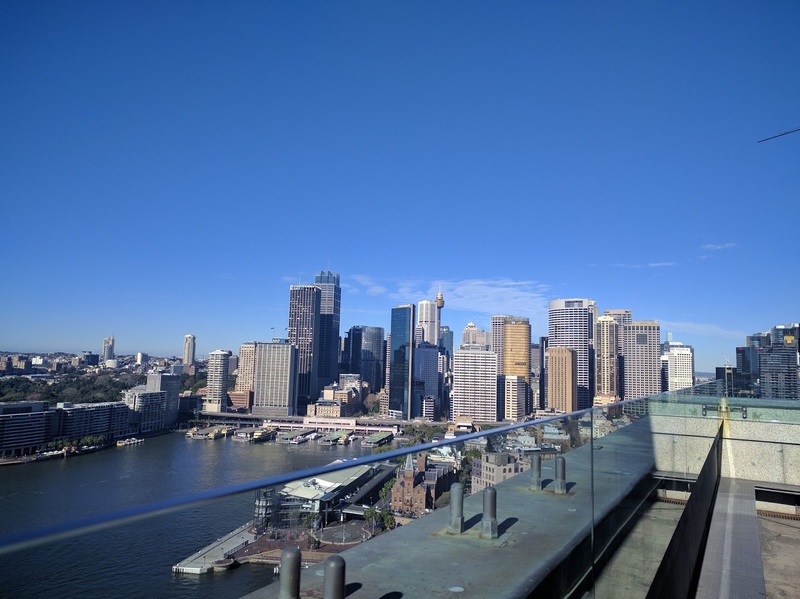 I spent my last day in Sydney relaxing at my hostel's rooftop (whilst I wait for my laundry to finish) and spent the afternoon wandering around the city.